in all sorts of light. 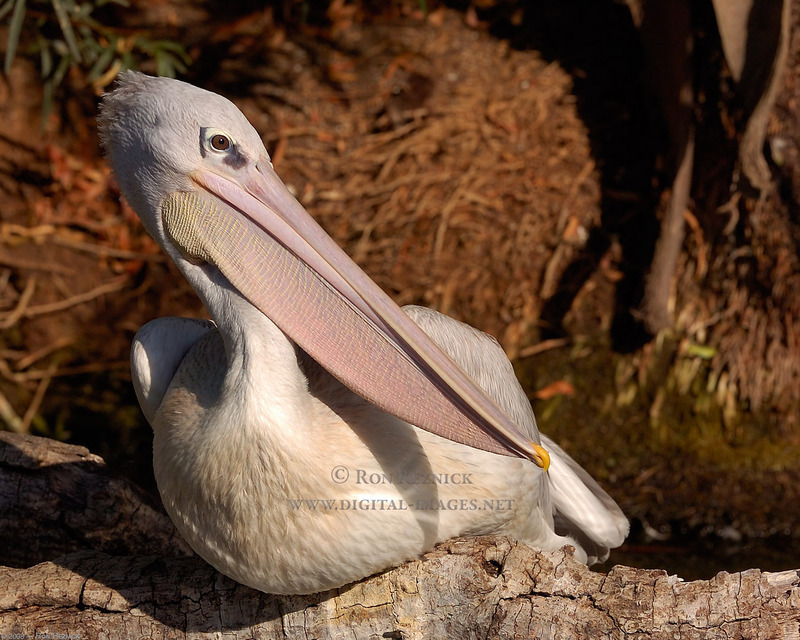 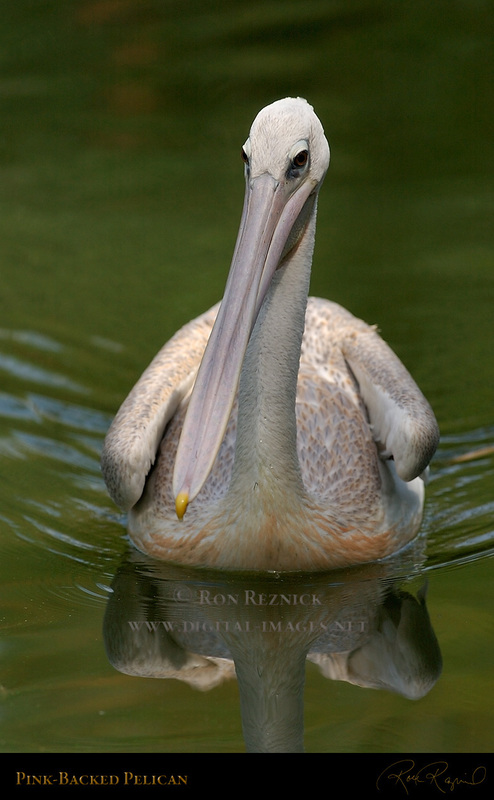 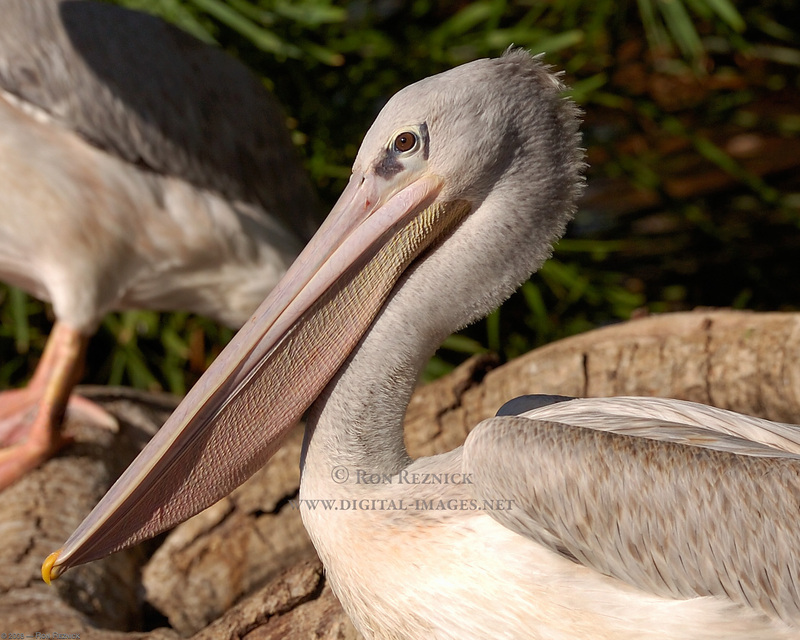 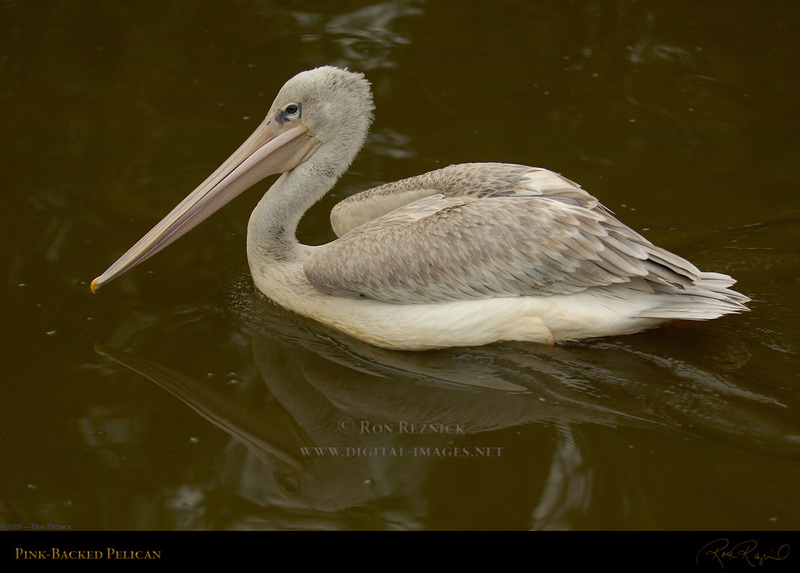 I have added images of Pink-Backed Pelicans, with some detail shots. 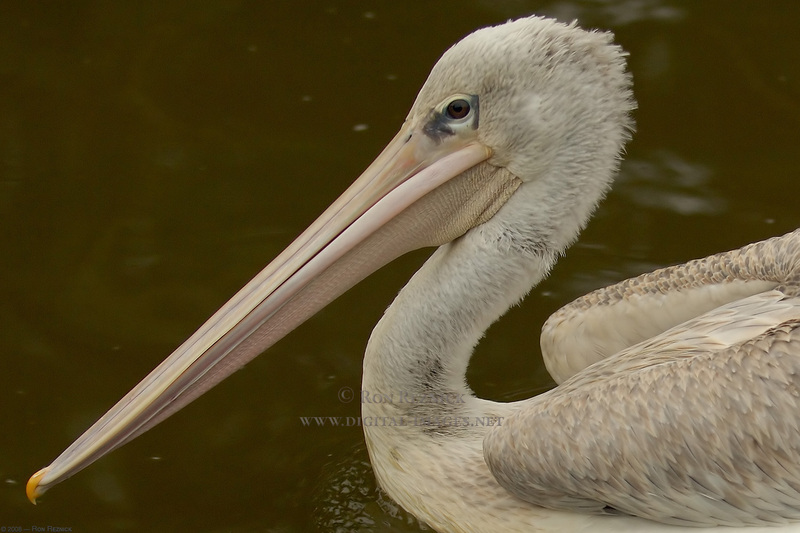 Images in this section are in two different Galleries on the Photoshelter website. 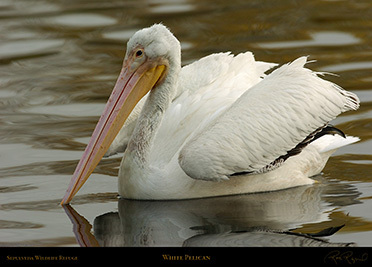 The Banner below leads to the Pelicans Collection where a Gallery can be selected. 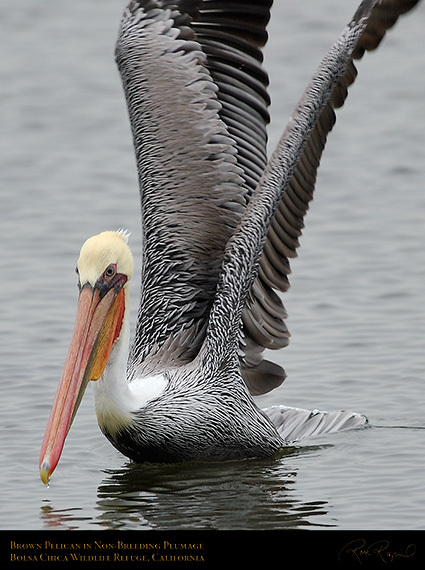 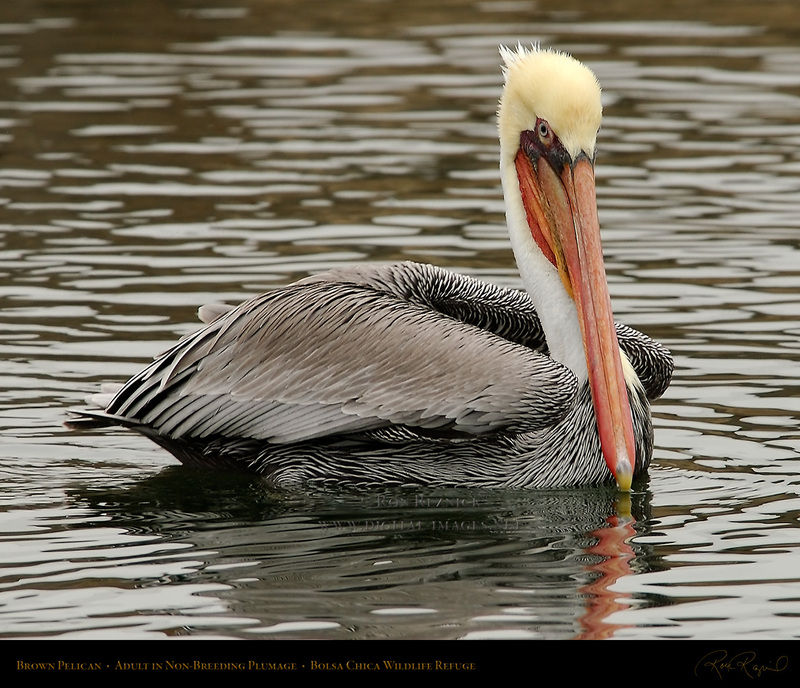 Unlike most other Pelicans, the Brown Pelican (and the similar Peruvian Pelican) feed by diving on their prey. The Brown Pelican is the smallest of the Pelicans, and like the White Pelican it is gregarious, living in flocks. 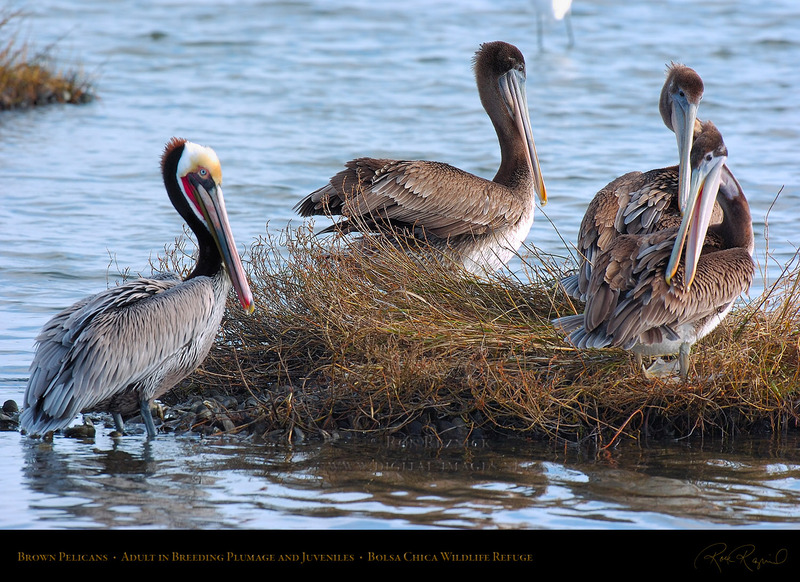 Below are portraits and composites of Brown Pelicans in breeding and non-breeding plumage and hunting. A Brown Pelican Juvenile, taken in January at Bolsa Chica Refuge. 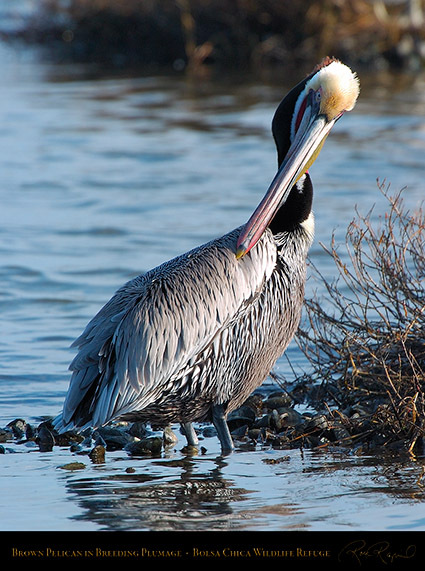 A Brown Pelican Juvenile at Bolsa Chica Refuge, with the typical mottled brown plumage. A Brown Pelican displaying post-Breeding Plumage in November. dark brown before breeding, but after breeding the neck turns white. A detail crop of a Brown Pelican in post-breeding plumage. 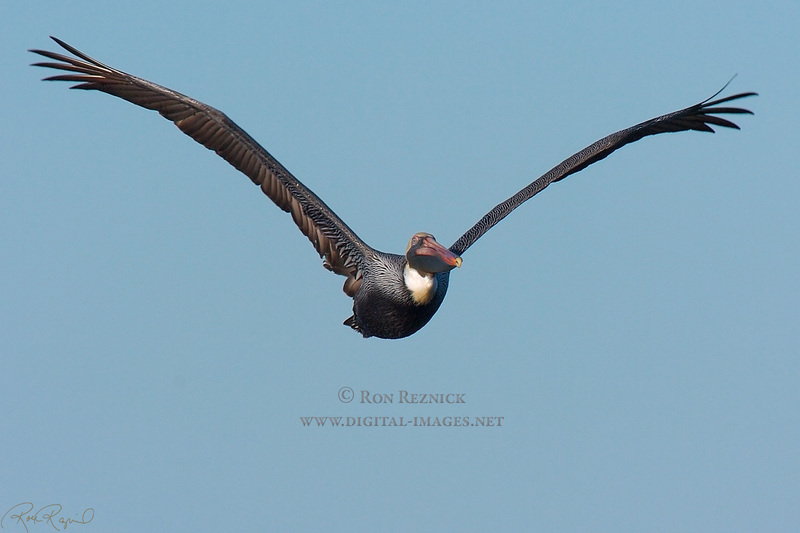 A detail crop of a post-breeding Brown Pelican taking off. 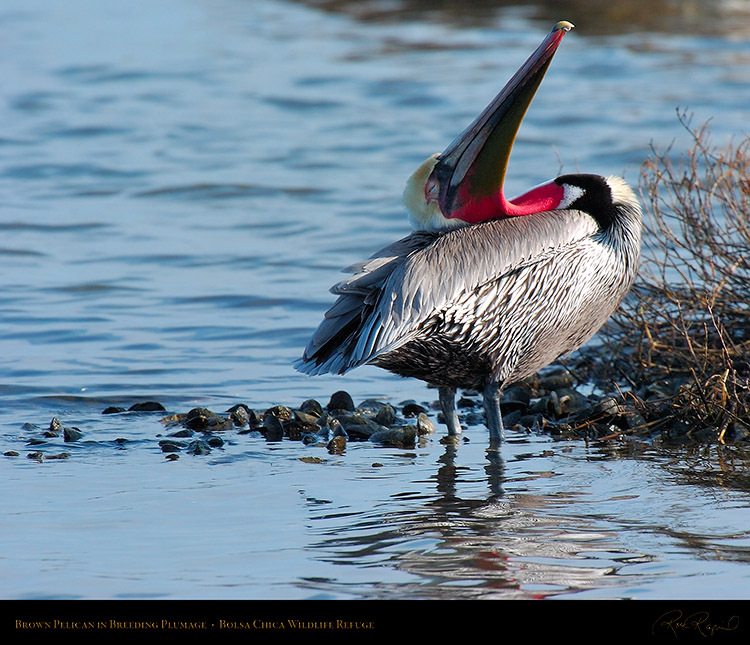 A Brown Pelican in Breeding plumage, preening at the edge of the Main Canal at Bolsa Chica. 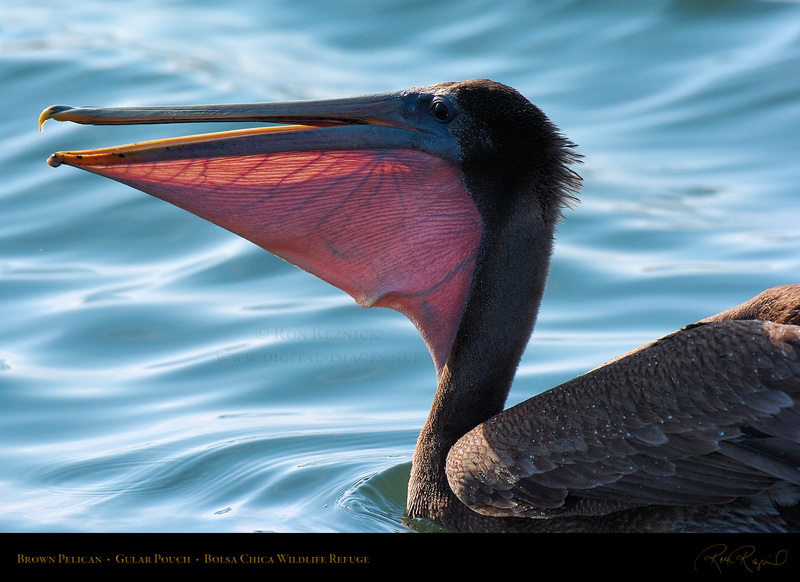 Note the dark brown neck and the brilliant red of the gular pouch and edges at the tip of the bill. 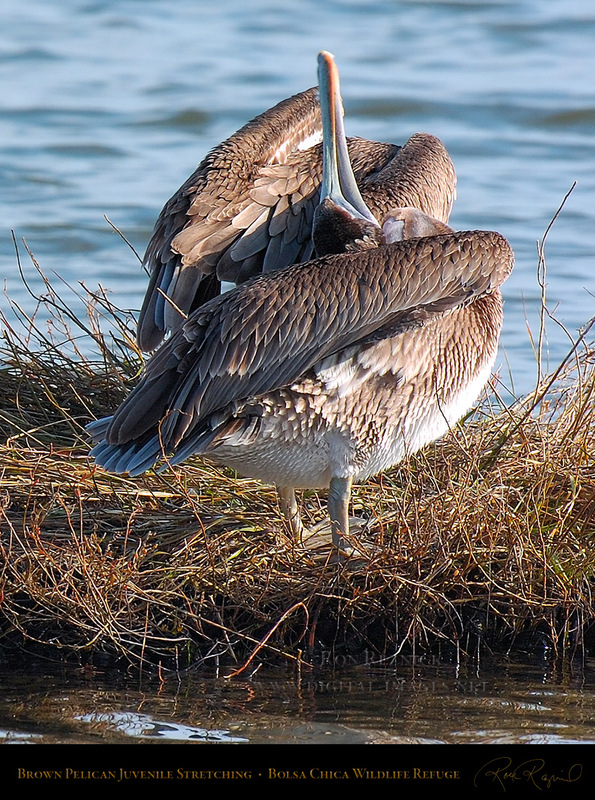 After preening, there is nothing like a good stretch, which also shows the brilliant red pouch and bill edges. The gular pouch of a juvenile Brown Pelican, backlit by the sun. 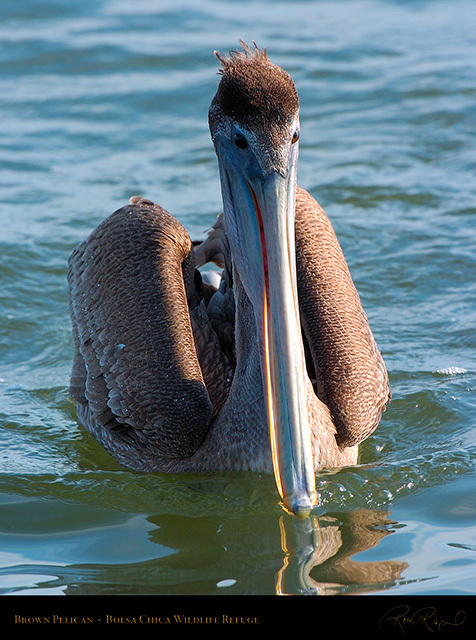 A Brown Pelican pouch can hold three gallons of fish and water. 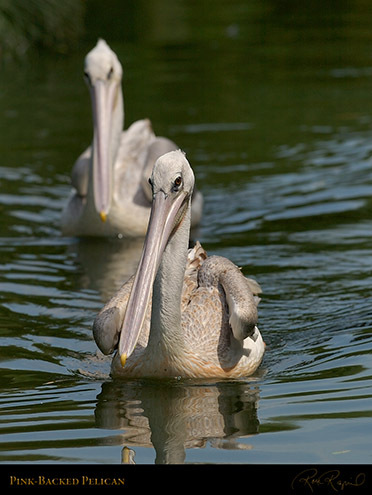 adult in Breeding plumage and three juveniles alongside the Main Canal at Bolsa Chica. 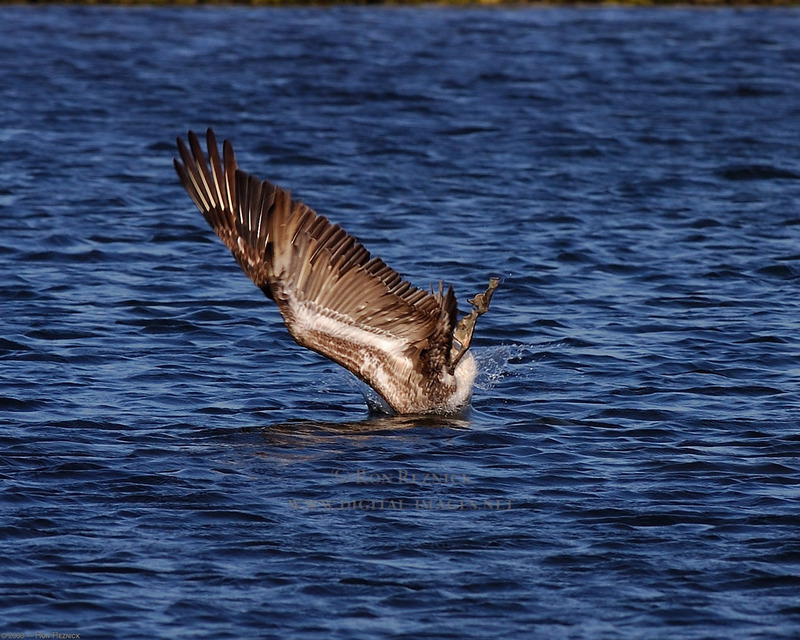 A detail crop of one of the juveniles taking a good post-preening stretch. 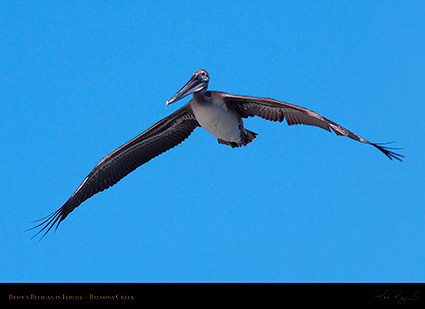 A non-breeding adult Brown Pelican in flight over the Main Canal at Bolsa Chica in April. A Brown Pelican in Breeding plumage, shot at sunrise in late November on Sanibel Island, Florida. 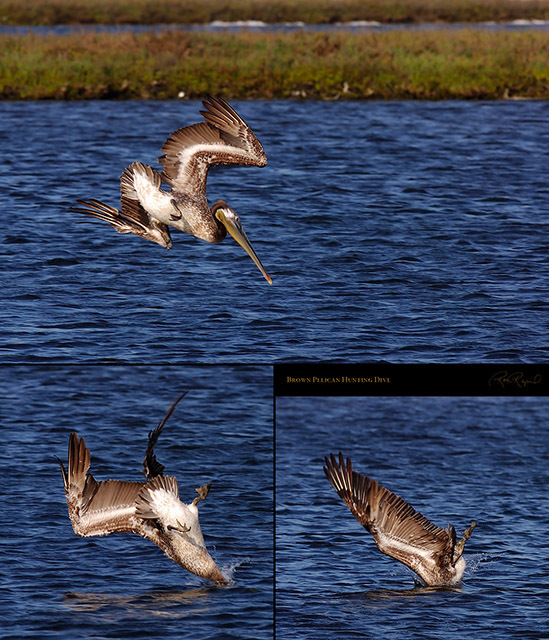 Two hunting dive shots from the composite images shown below, taken at Bolsa Chica Wildlife Refuge. 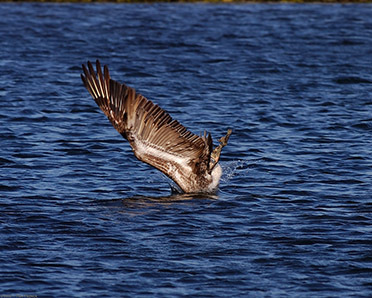 flight just before they hit the water, so the bird often enters the water sideways or upside down. 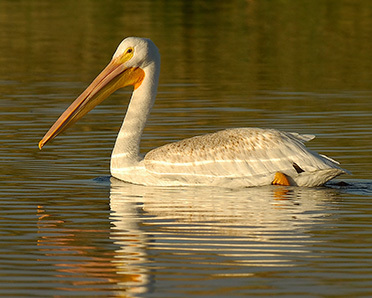 plunging into a canal at Bolsa Chica Refuge in a hunting dive just before sunset in late May. 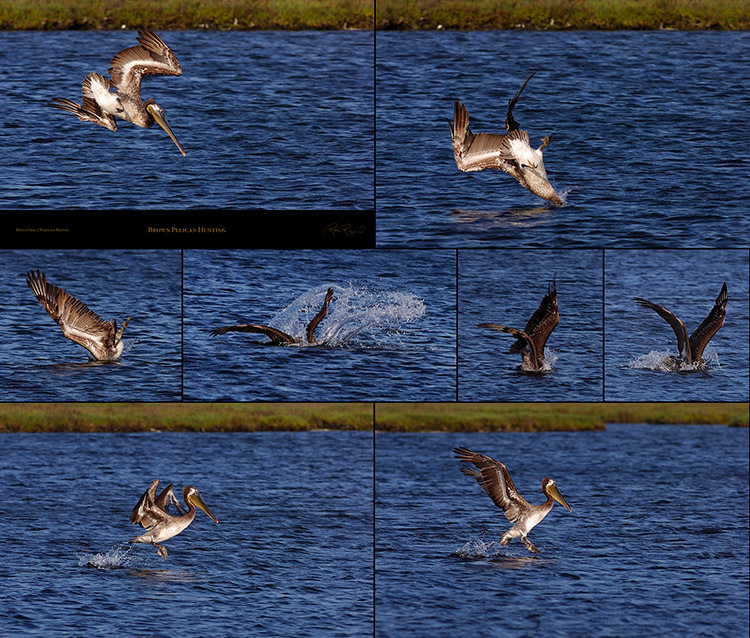 A 1500 x 640 composite of a Brown Pelican hunting dive sequence from Bolsa Chica Wildlife Refuge. 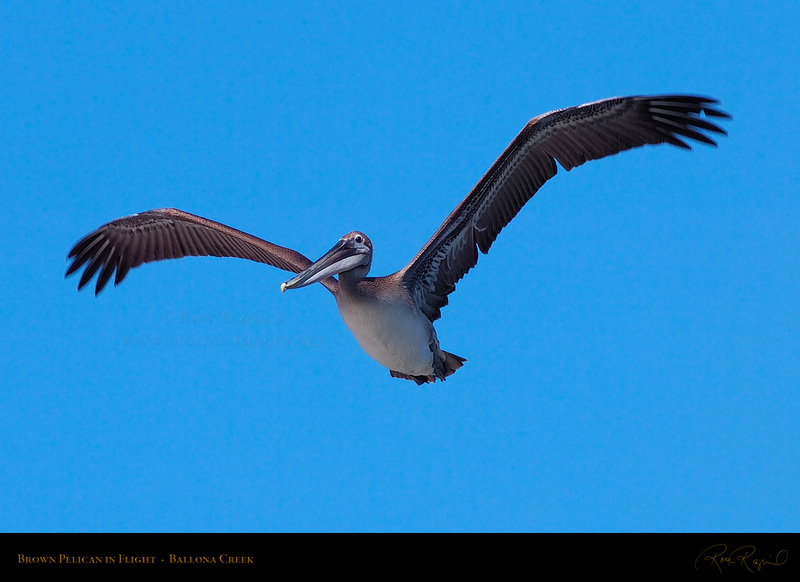 A 1500 x 1223 composite image of a Brown Pelican hunting dive at sunrise off Sanibel Island, Florida. 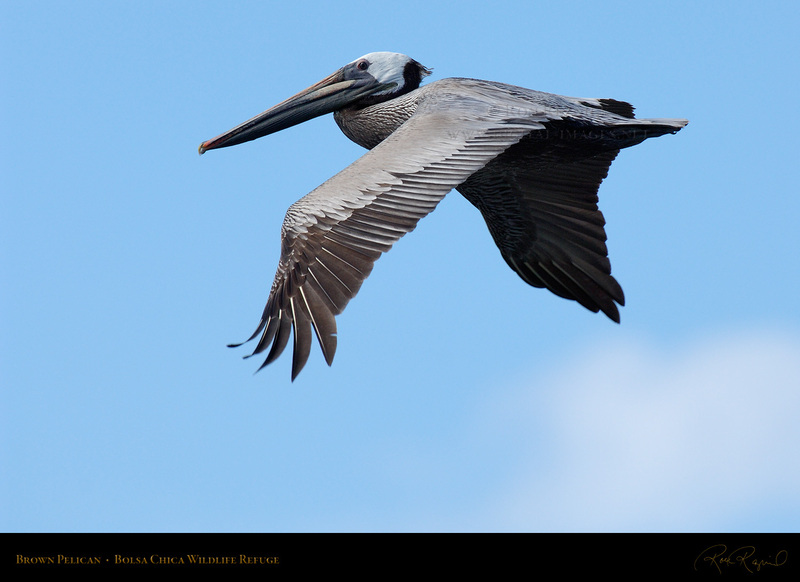 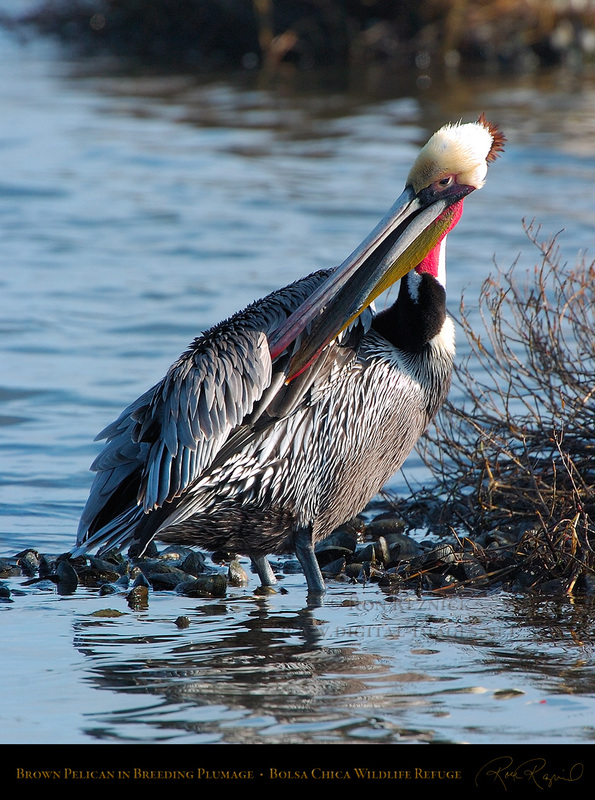 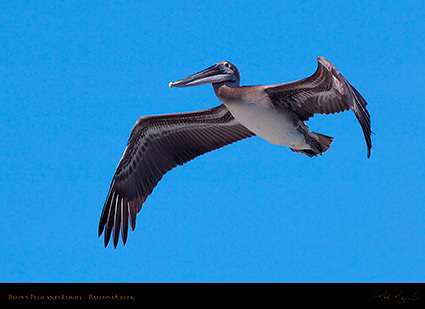 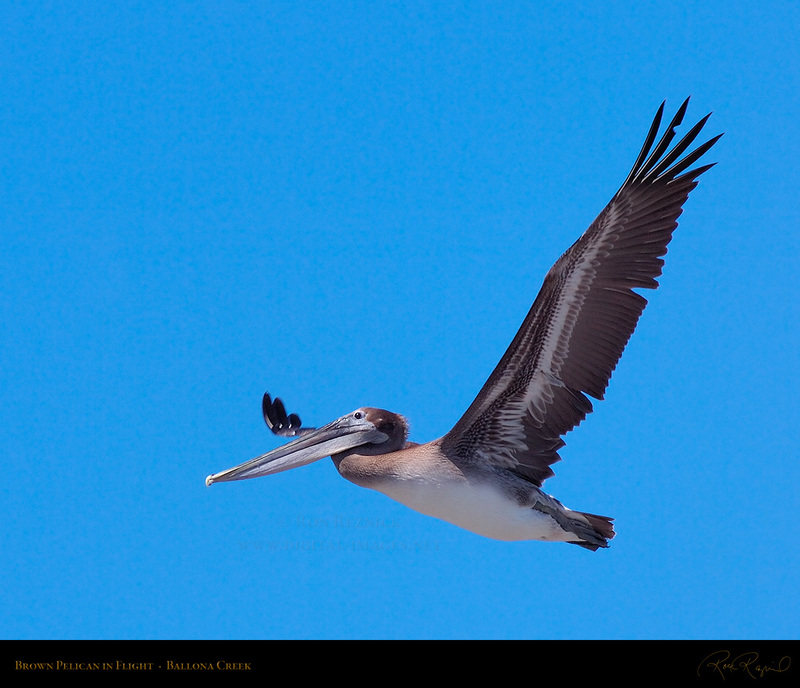 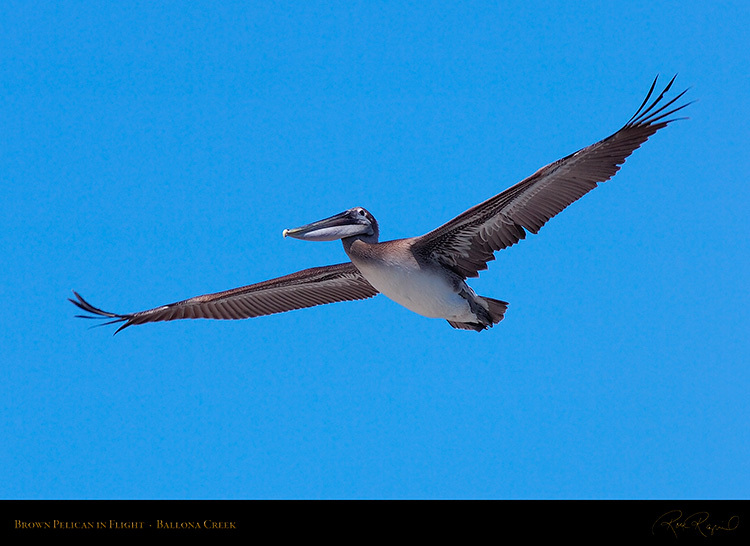 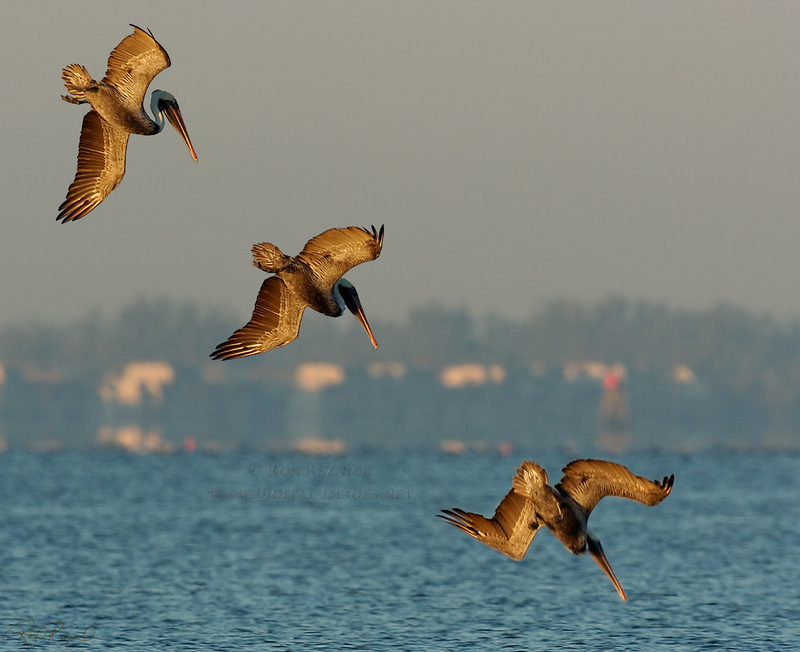 More images of Brown Pelicans are in the Bolsa Chica and Florida Wildlife sections. A juvenile Brown Pelican in flight over Ballona Creek in the late afternoon in July. Two juvenile Brown Pelicans in flight, taken head-on over Ballona Creek. 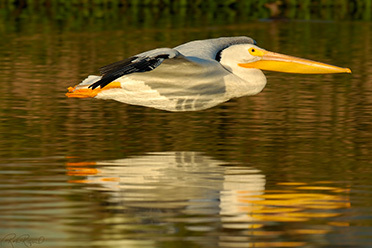 a sharp head-on image in flight as the bird often flies through the depth of field of a telephoto lens. 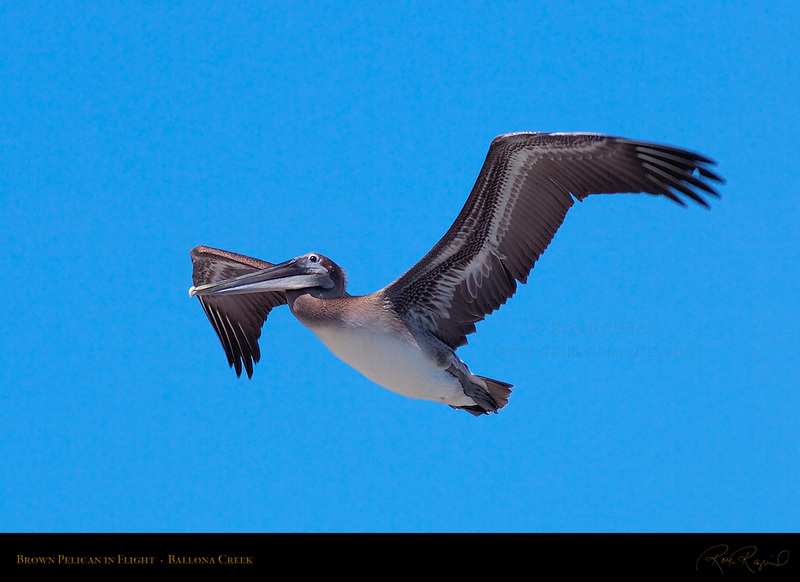 A juvenile Brown Pelican in somewhat ragged summer plumage, captured as it passed directly overhead. Unlike the typical grayish color of the gular pouch in non-breeding plumage, this bird has a yellowish pouch. 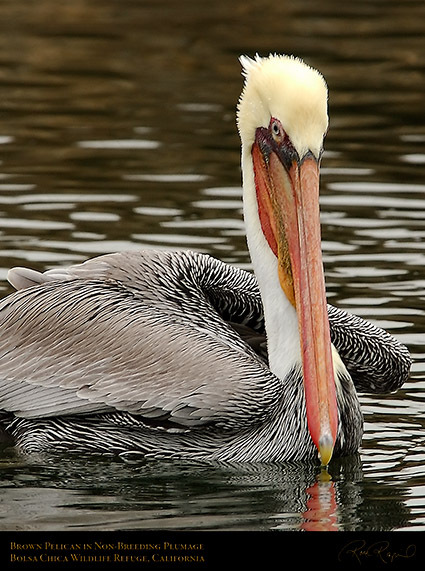 A Brown Pelican (with the typical grayish gular pouch) on a head-on approach at Ballona Creek. 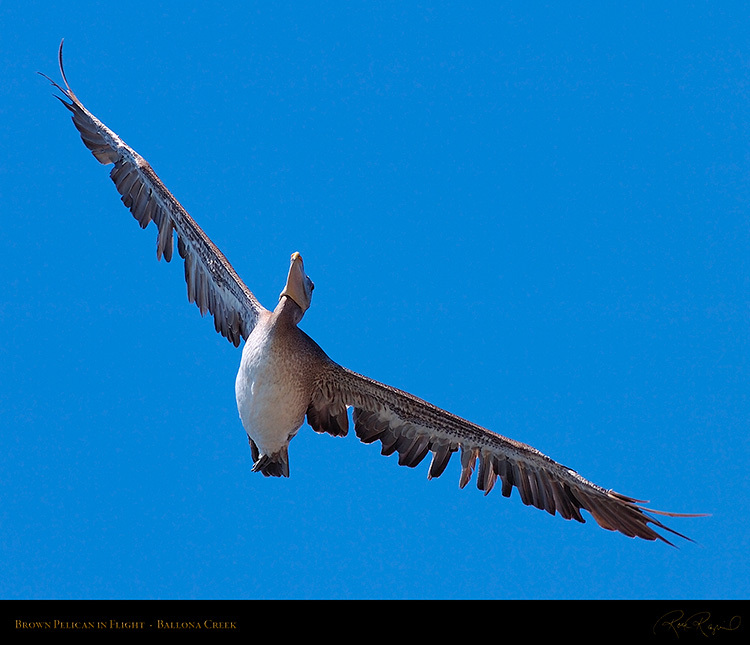 the Flight Study Composite, but along with the images in the composite, it is available separately. 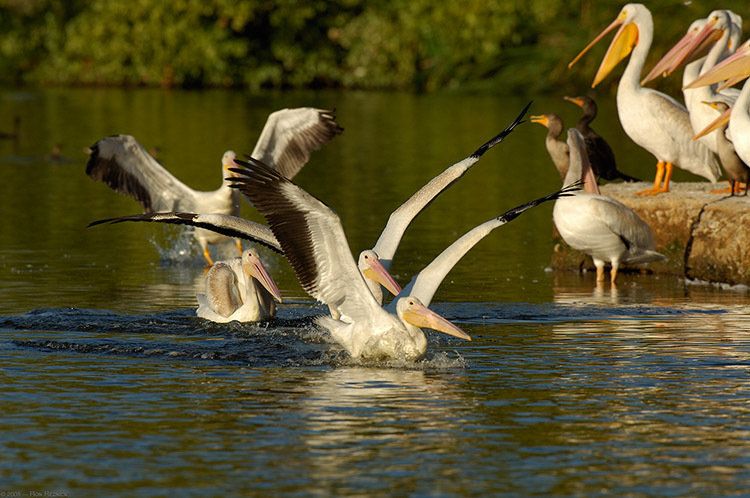 turn following Ballona Creek. The Pelican’s wings are so efficient that it does not need to flap much. 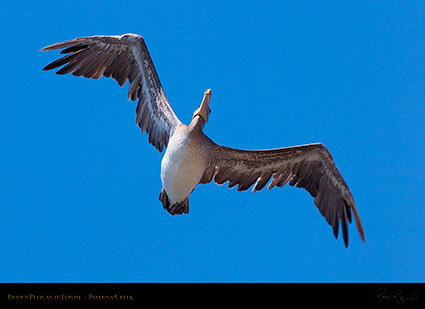 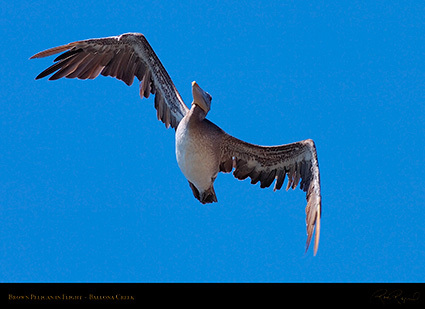 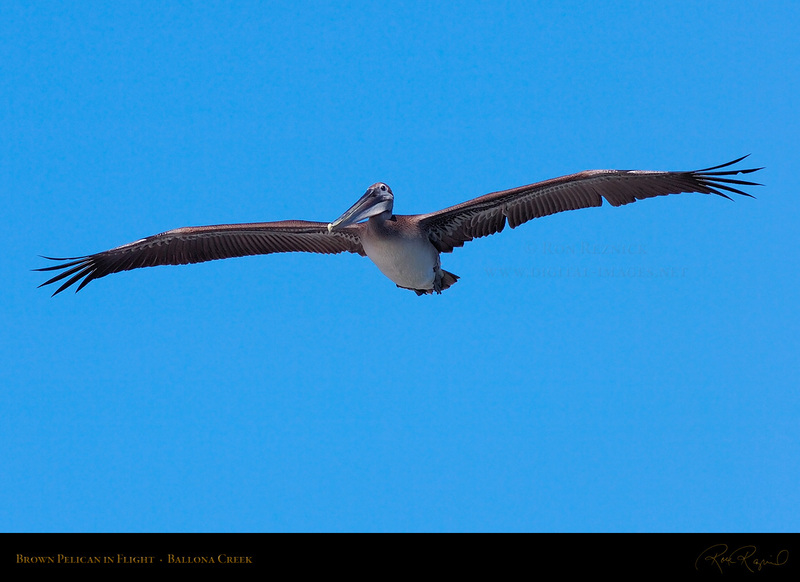 A Brown Pelican with its wings in soaring position as it begins a shallow turn past the photographer. These images show superb detail of the underwing coverts and the primary and secondary feathers. 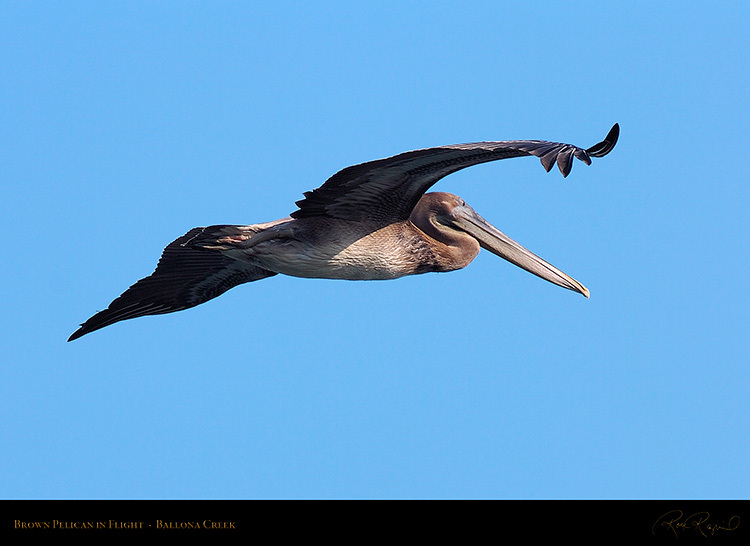 A juvenile Brown Pelican displays its wing detail as it flies past the photographer at Ballona Creek. 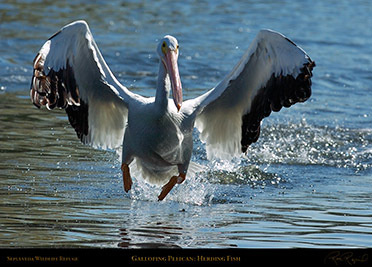 displayed in the previous image as he makes a slow left turn past the photographer at Ballona Creek. 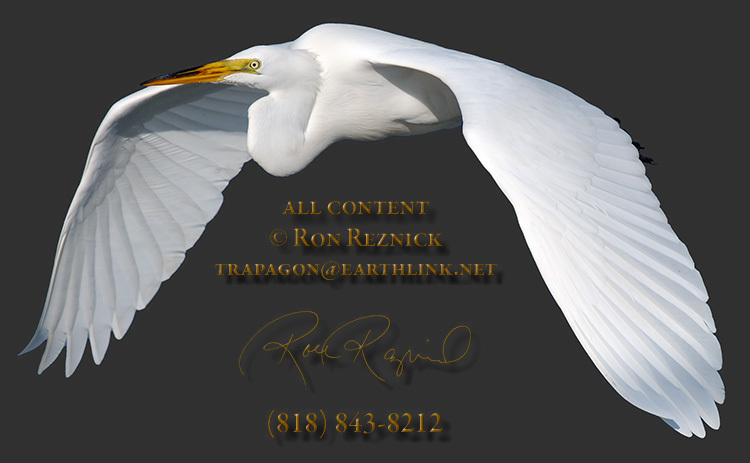 The XXL Composite makes a spectacular 5 to 6 ft. wide panoramic print. 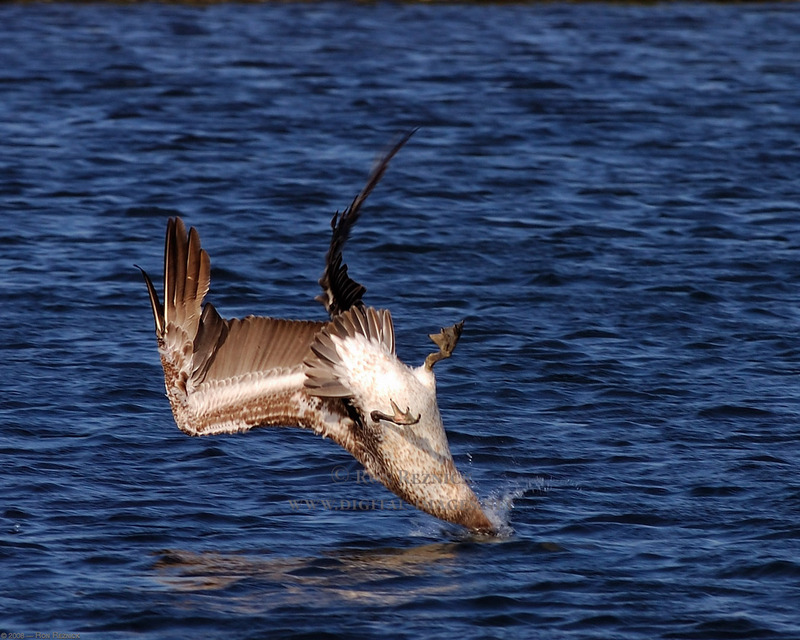 body and head makes it difficult to track focus, and maintaining a focus lock through a sequence is rare. taken on an overcast December morning at Sepulveda Wildlife Refuge. 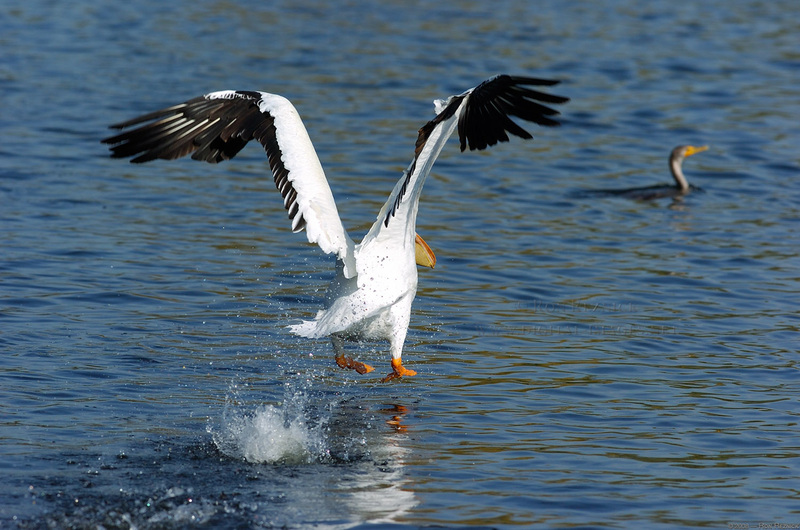 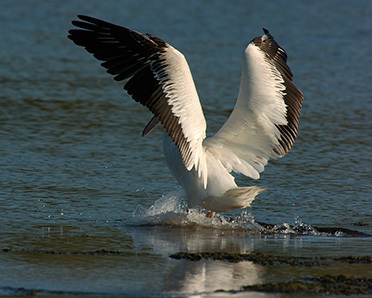 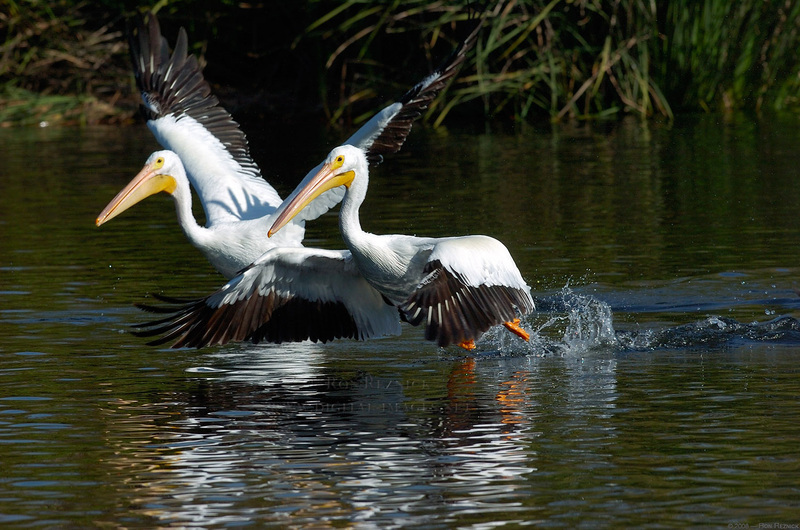 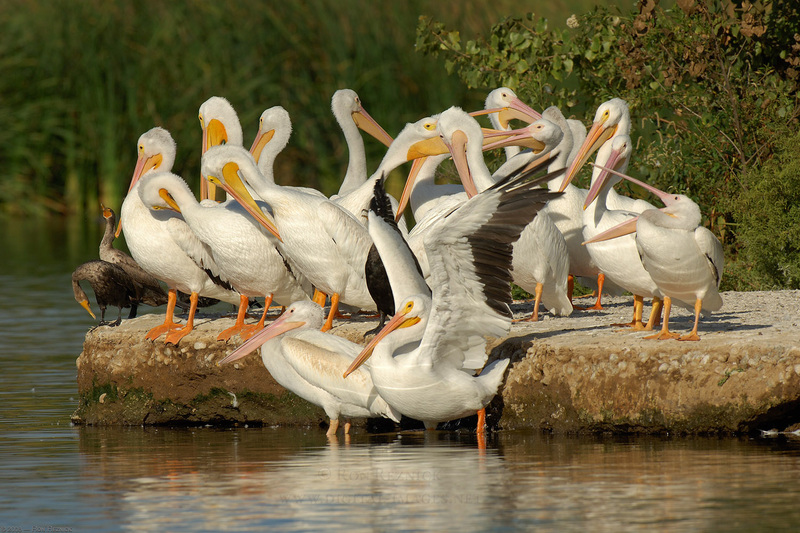 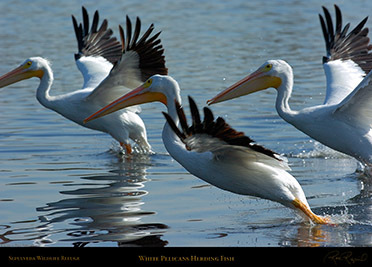 White Pelicans cooperate to herd fish in shallow water, and are often seen with Double-Crested Cormorants. 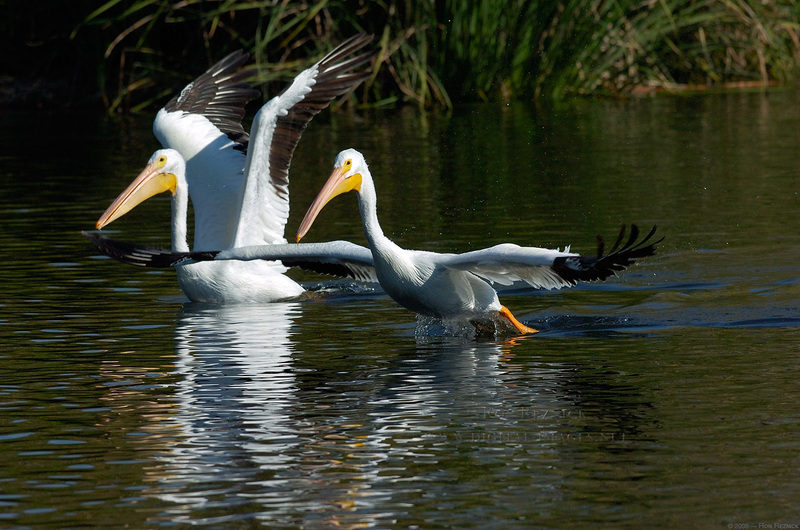 White Pelicans in flight at Sepulveda Wildlife Refuge. with the second longest wingspan after the California Condor. 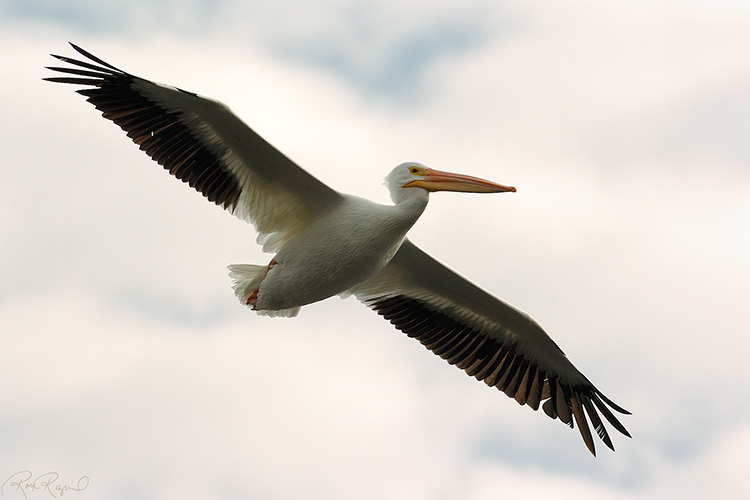 It uses its broad 9-10 ft. wings to soar in flight. when the skies are clear due to the bright reflections off their feathers. better examination of feather detail when shots are taken at mid-day. 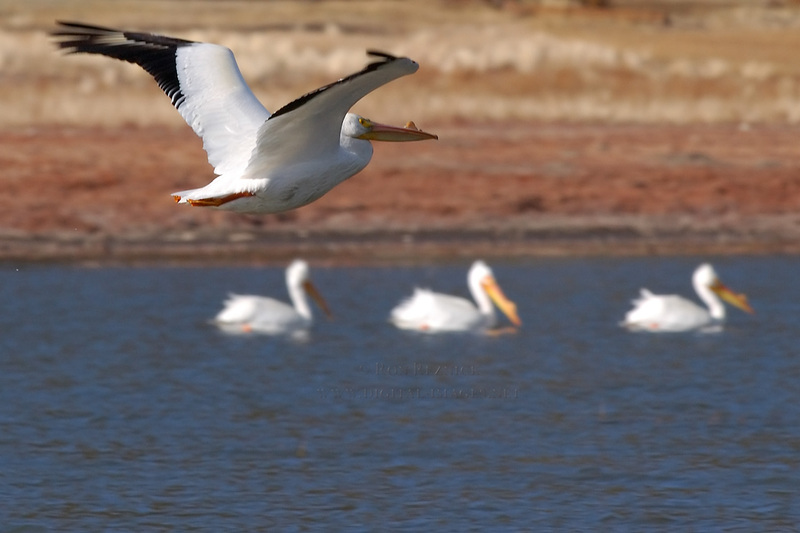 White Pelicans are a lot easier to shoot on cloudy days too. 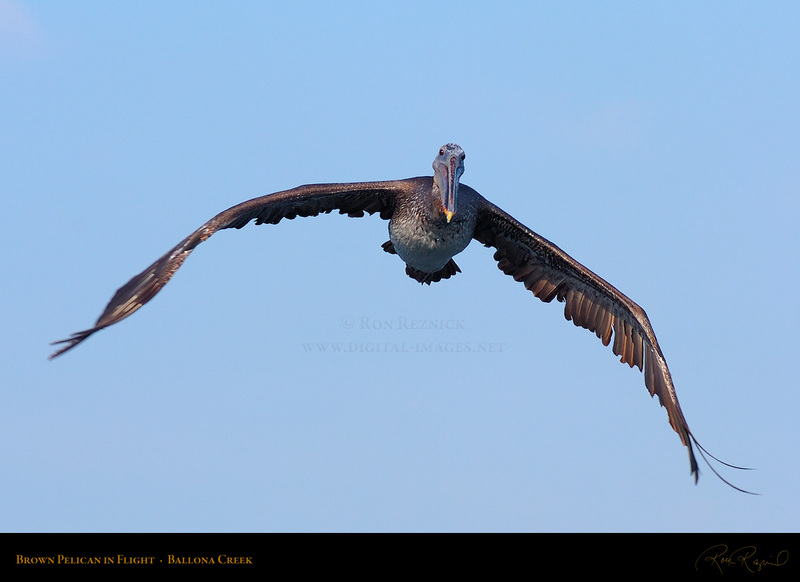 day at noon... the difficulties will be immediately apparent. 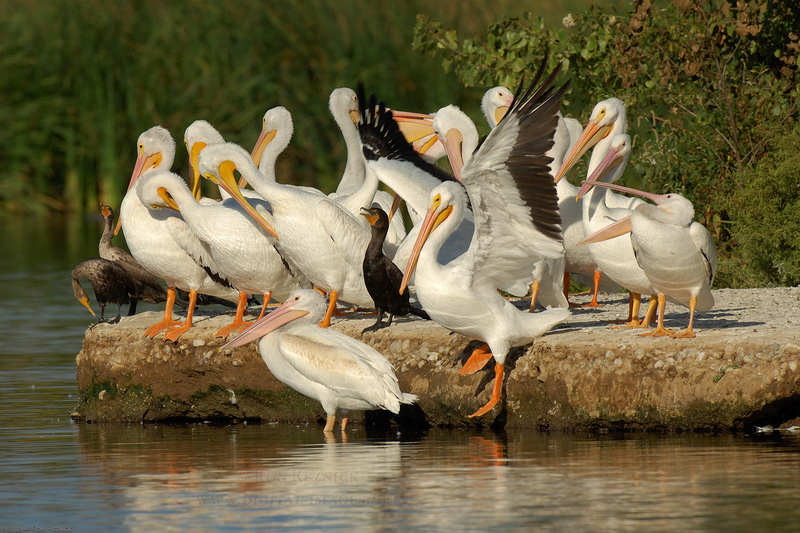 Posing Pelicans at Sepulveda Wildlife Refuge. 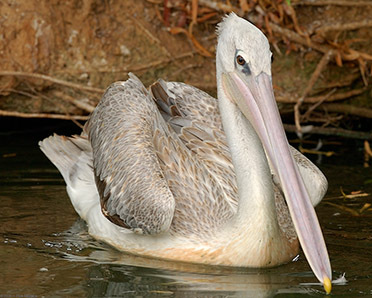 which the Pelican uses to store caught fish (it spills water from the pouch before swallowing its catch). 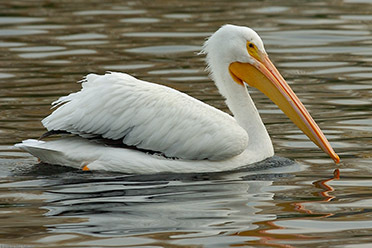 Pelicans eat up to three lbs. 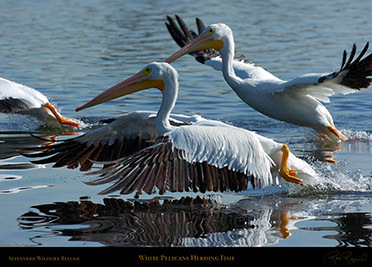 of fish a day, and only carry food in their pouch when delivering it to their chick. 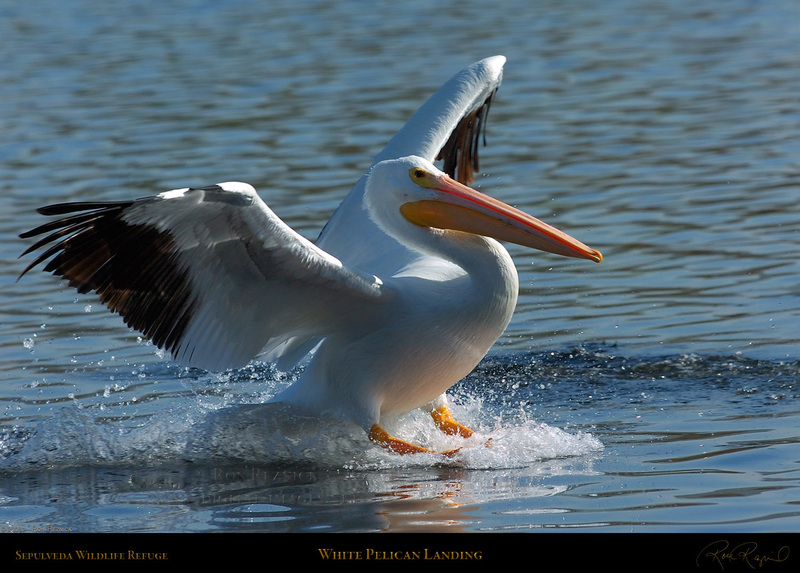 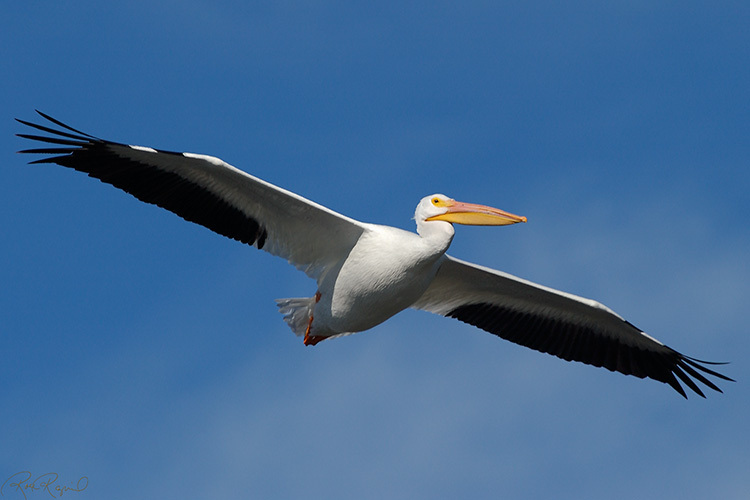 White Pelicans are among the heaviest flying birds in the world, weighing from 9 to 30 pounds. Pelicans are very clumsy on land, but they are excellent swimmers and are quite graceful in the air. 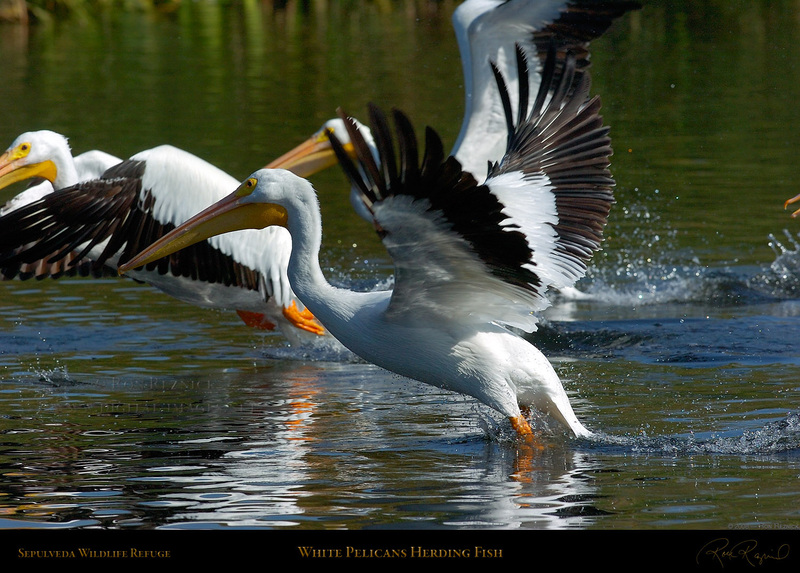 White Pelicans with the horn on the bill which they display during mating season. 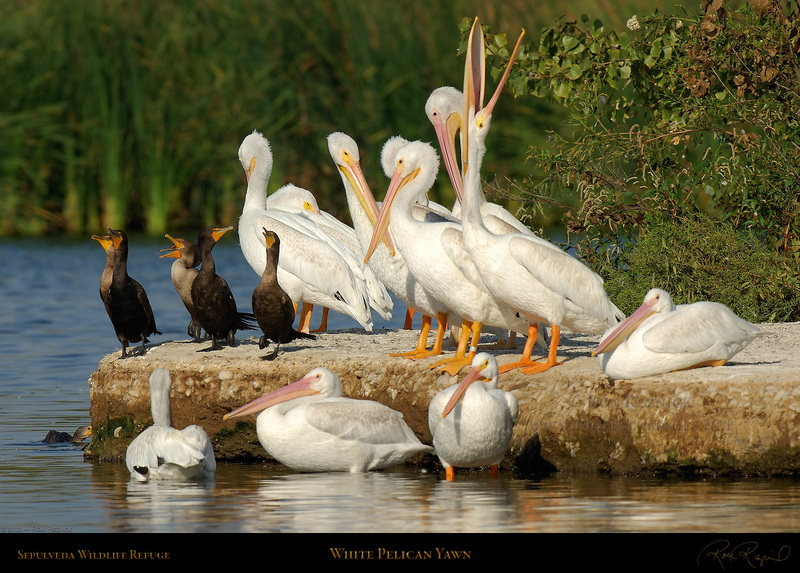 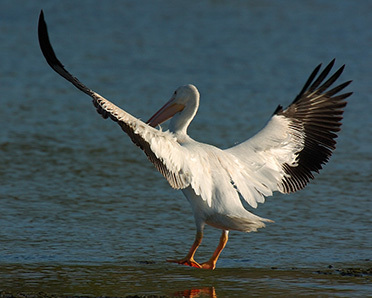 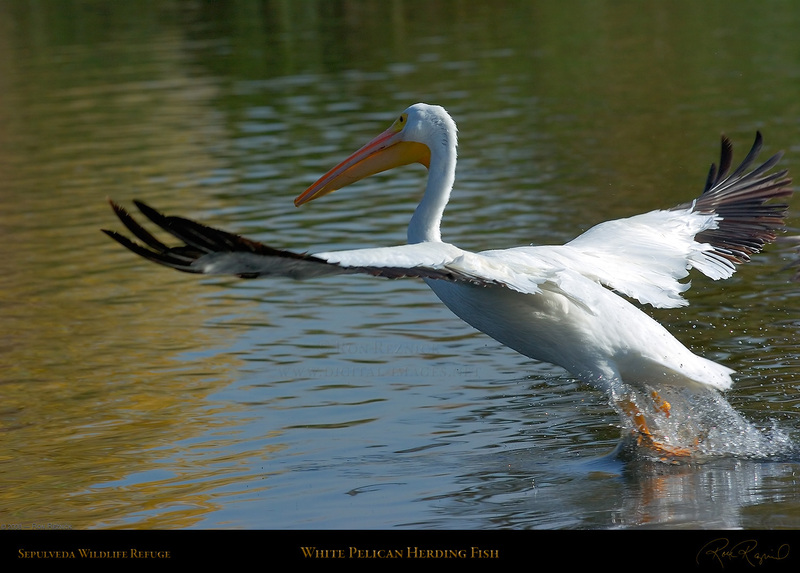 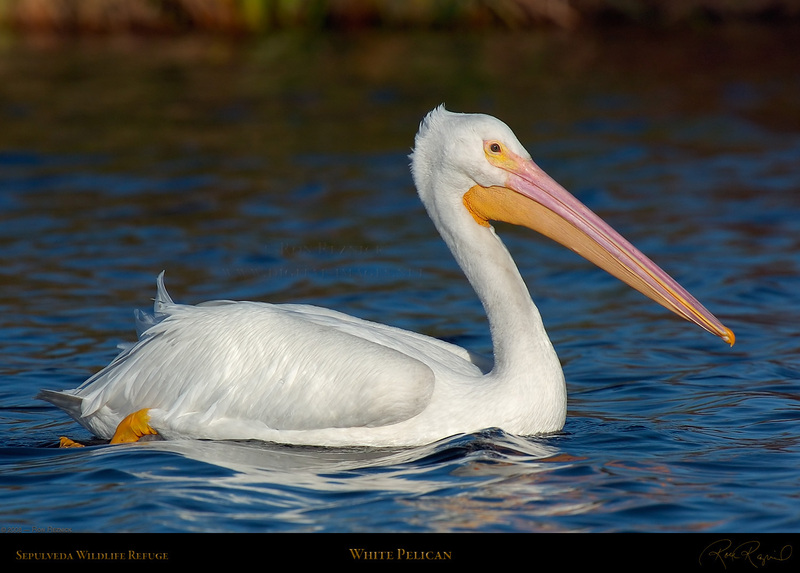 White Pelicans are the only one of the eight species of Pelican to have a horn on their bill. 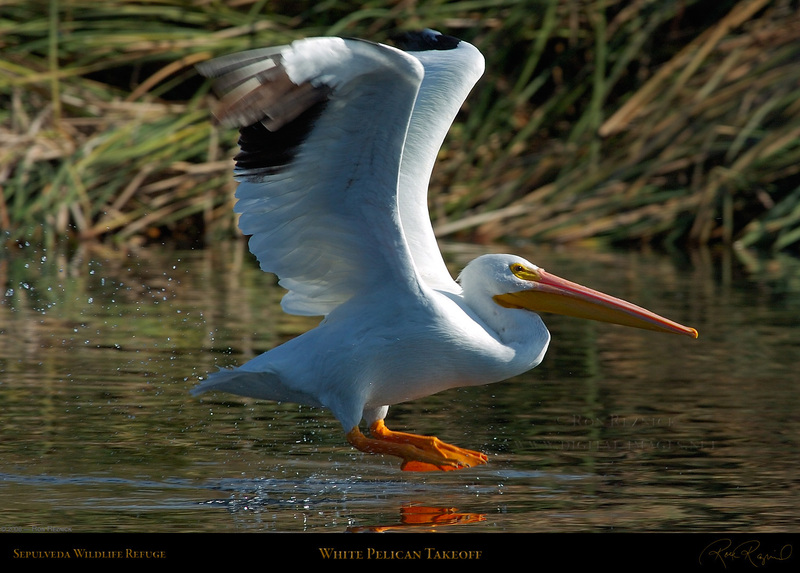 A White Pelican soars over Sepulveda Wildlife Refuge in the early afternoon in mid-November. 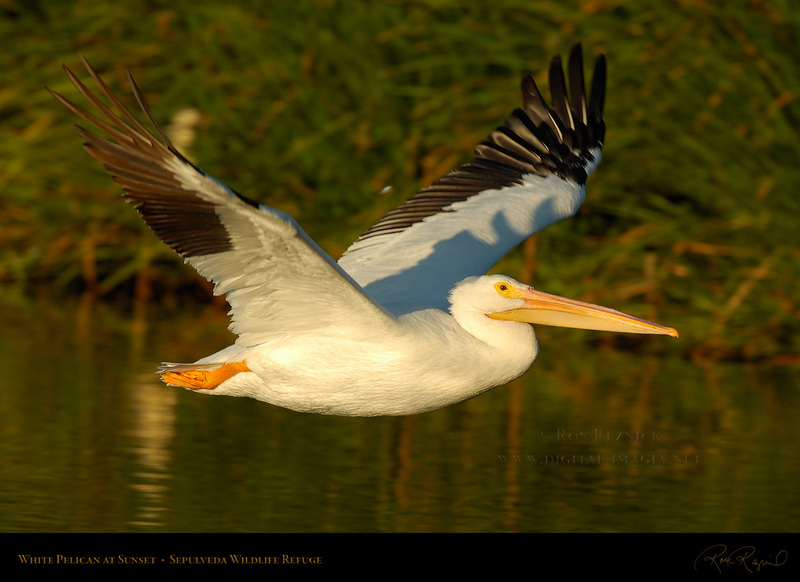 Notice that the projection or horn on the bill (the nuptial tubercle) is beginning to grow. 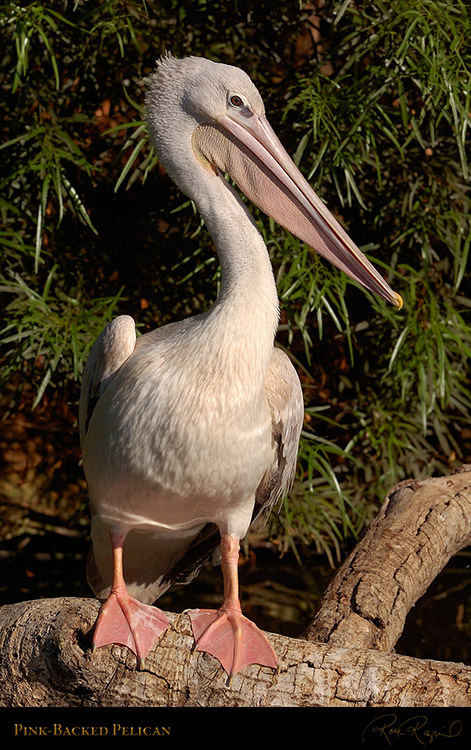 or on the bill. 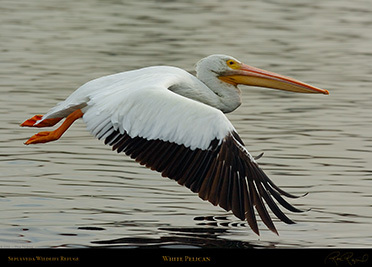 The bill is best as it will put the head in the focused plane regardless of the aperture selected. Shot late in the afternoon at Sepulveda Wildlife Refuge. Notice how dark the water appears in these shots. 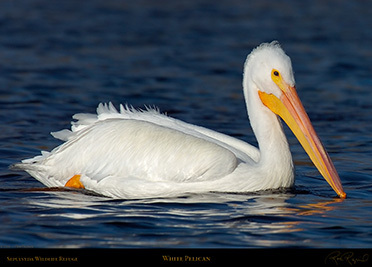 The water is dark because of the exposure compensation which is required to properly expose the white bird. 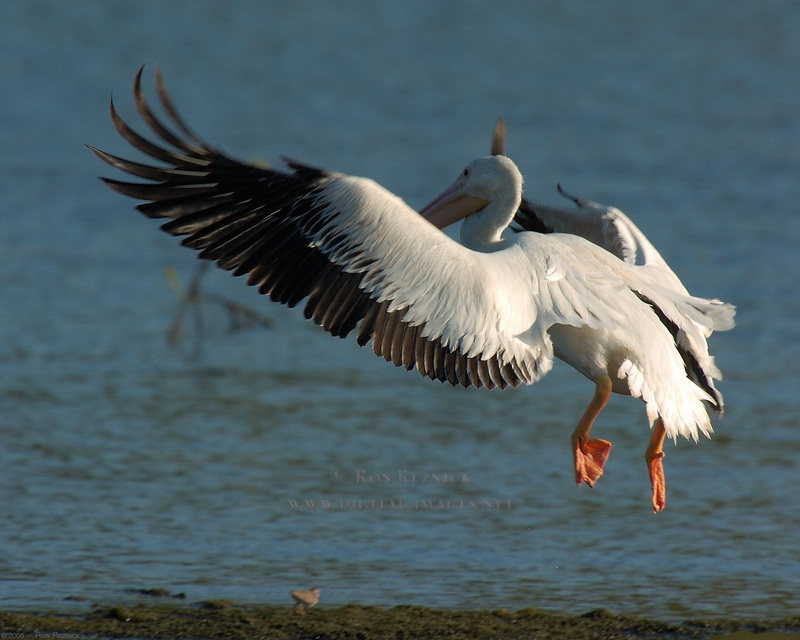 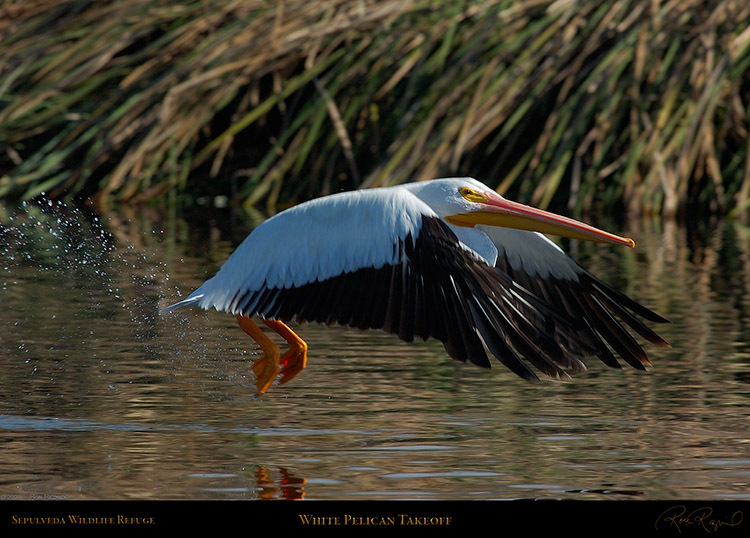 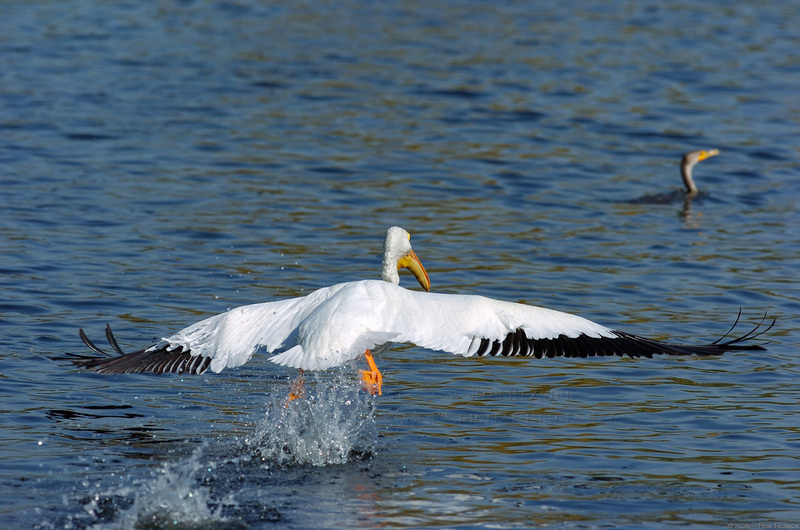 A White Pelican takeoff, taken in the late morning on a clear day at Sepulveda Wildlife Refuge. 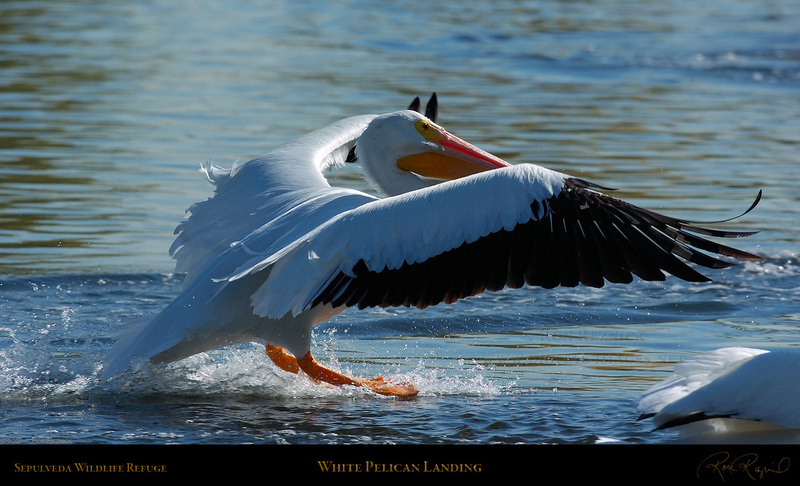 Achieving proper exposure of a White Pelican under these conditions can be quite challenging. 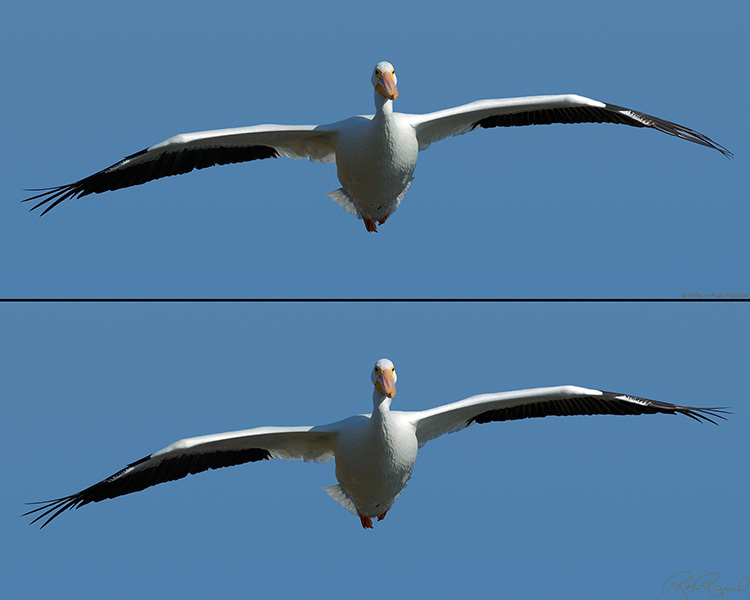 These two images are part of a takeoff sequence which is shown in the composite image below. 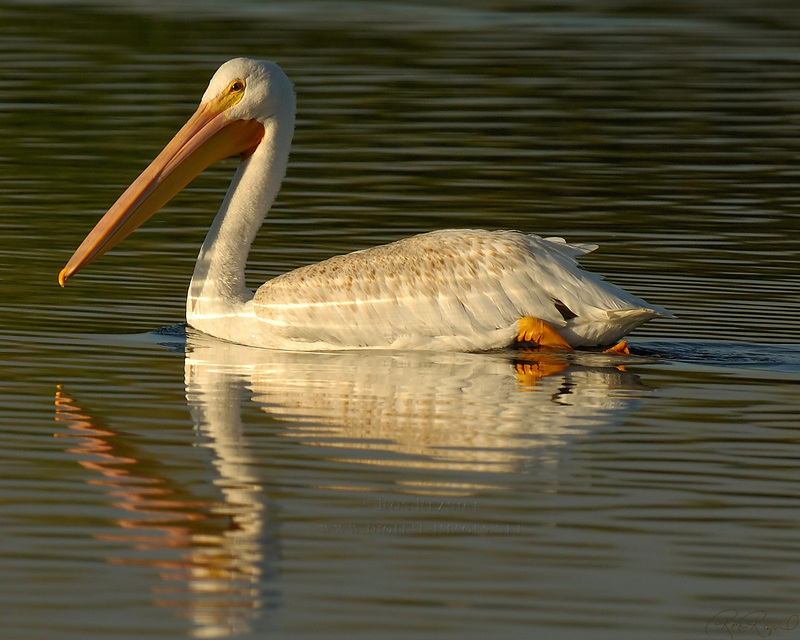 in the late morning at Sepulveda Wildlife Refuge in Los Angeles. 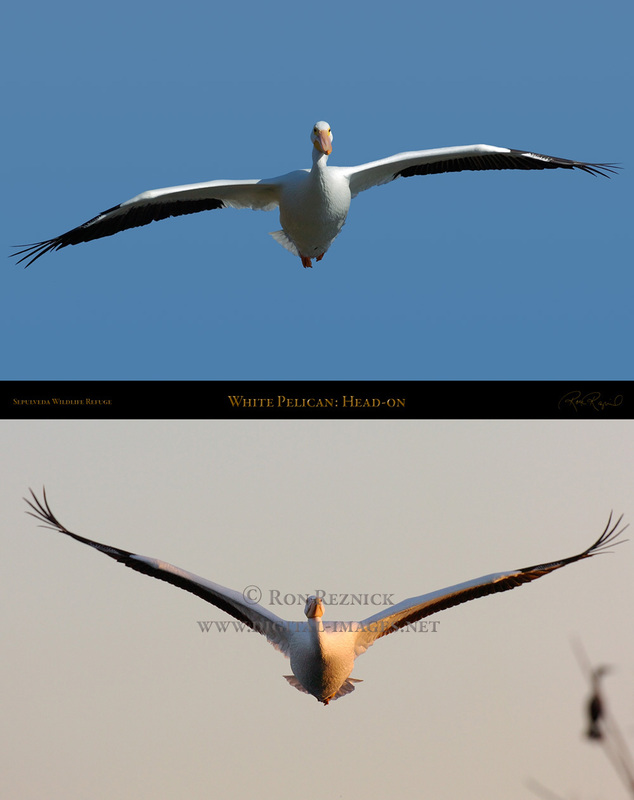 backgrounds and back again, and the subject is bright white in the morning sunlight. 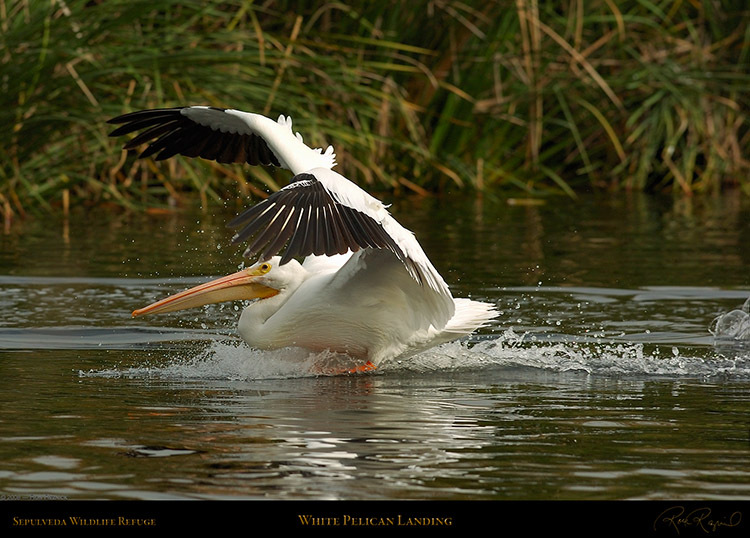 A White Pelican hops across the surface of the pond to gain speed as it takes off in the late morning. 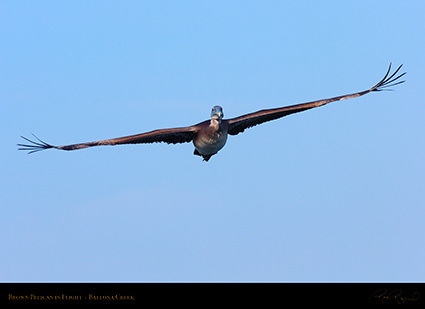 the exposure as the bird occludes a darker or lighter background. to set the exposure compensation, the sequence will be ruined. 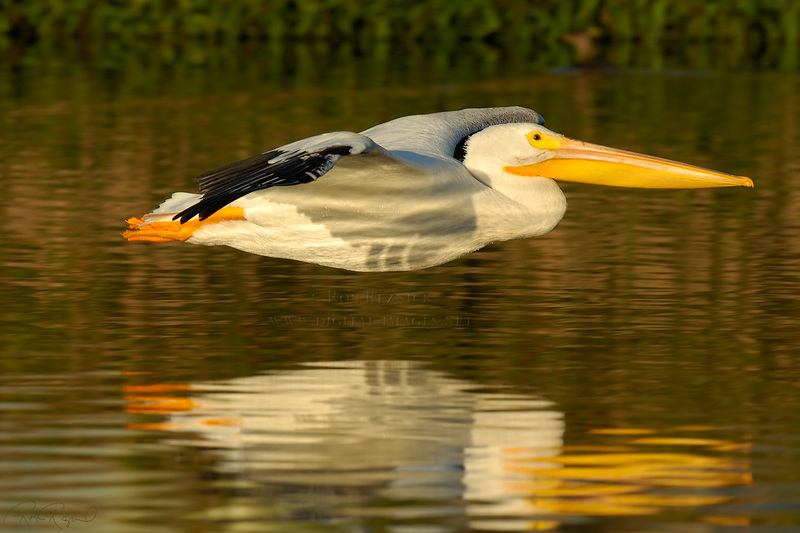 It is far better to pre-meter the subject and use the manual mode. 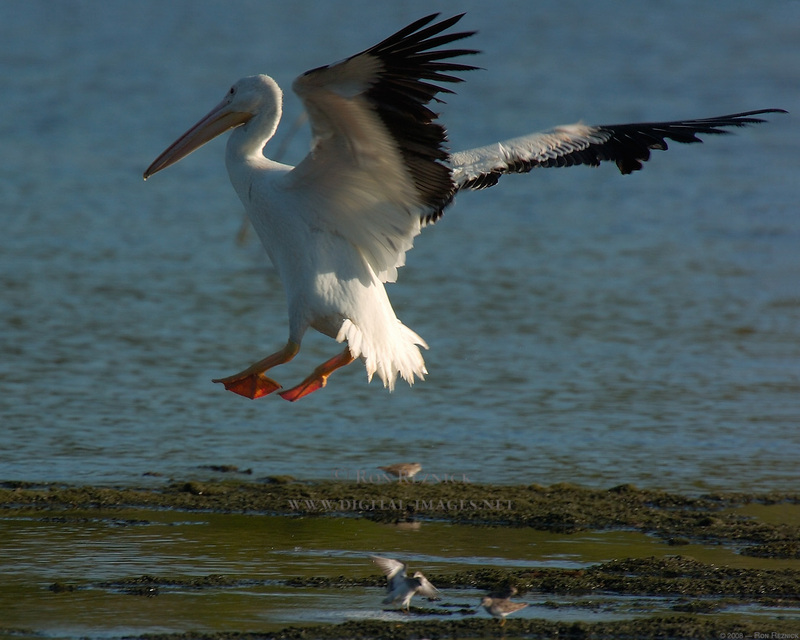 a White Pelican taking off in the late morning at Sepulveda Wildlife Refuge. 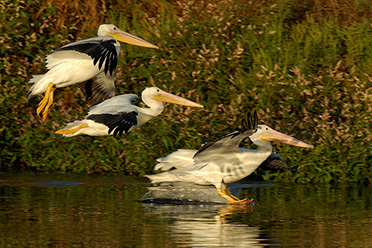 dragging their feet and tails to herd fish into the shallows in a cooperative feeding technique. 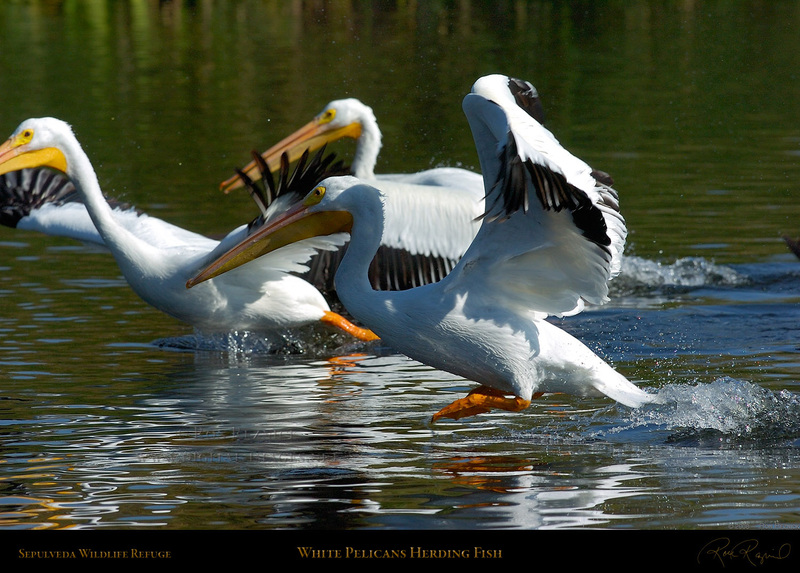 they surface dive on the ball to grab as many fish as possible before they disperse. They fly close to the water and drag their feet, run or hop, splashing the surface to scare the fish. 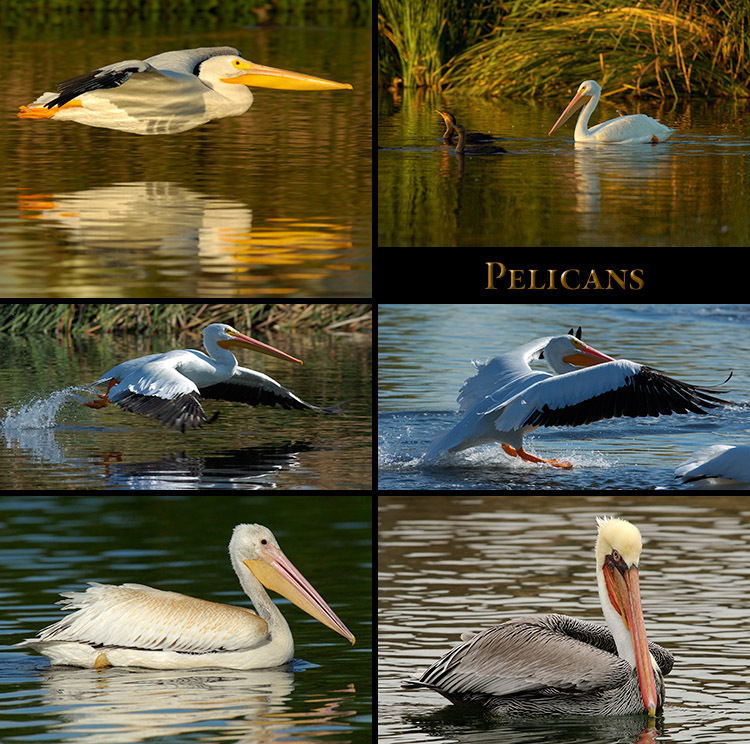 These shots were all taken at mid-day at Sepulveda Wildlife Refuge in late November. scooping air with their wings and dragging their tail in the water to slow down. A White Pelican landing at the edge of the Gulf waters off Sanibel Island, Florida in late November. 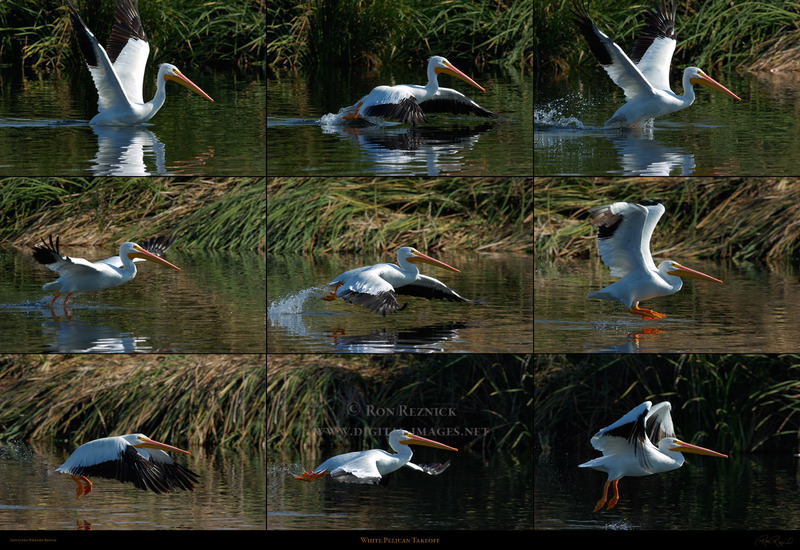 A 1505 x 1425 composite of a White Pelican landing at Sepulveda Wildlife Refuge in November. A 1000 x 1364 composite of White Pelicans in head-on flight at Sepulveda Wildlife Refuge. The upper shot was taken at mid-day in November, and the lower one at sunset in January. 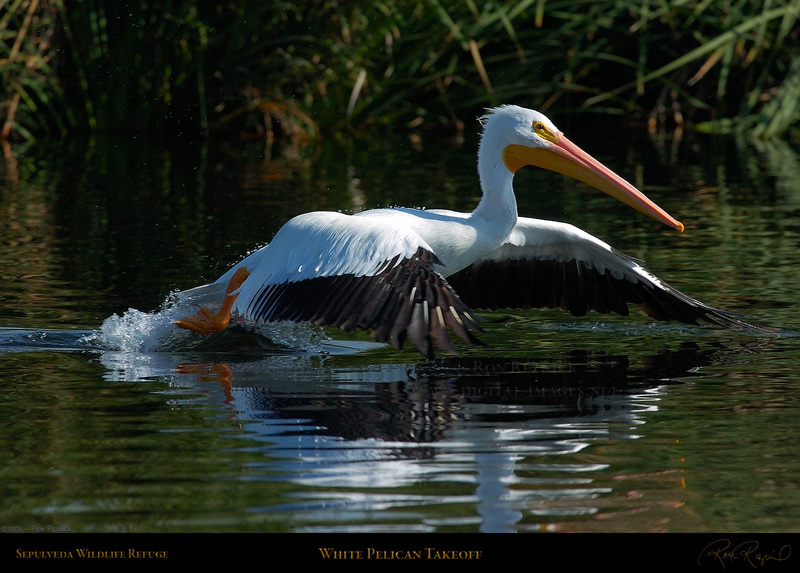 movements which the White Pelican uses to compensate for the shifting wind. 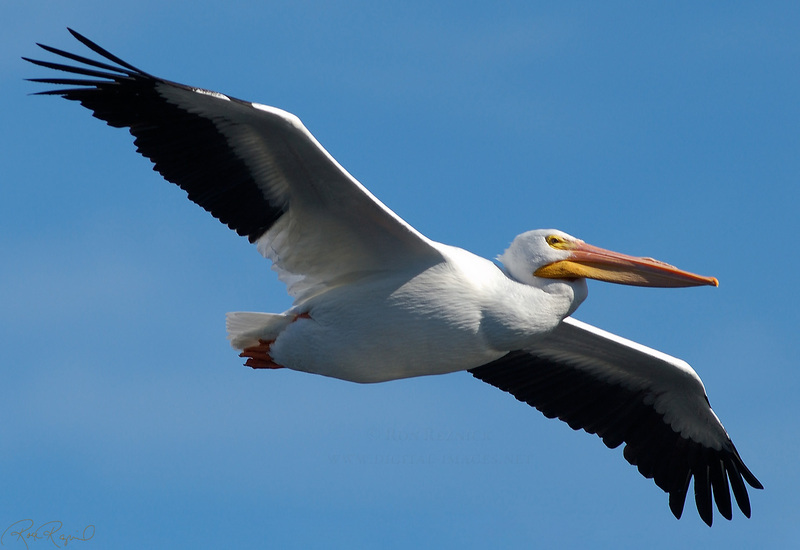 You may want to right click to open this image in a new (non-expanded) window. 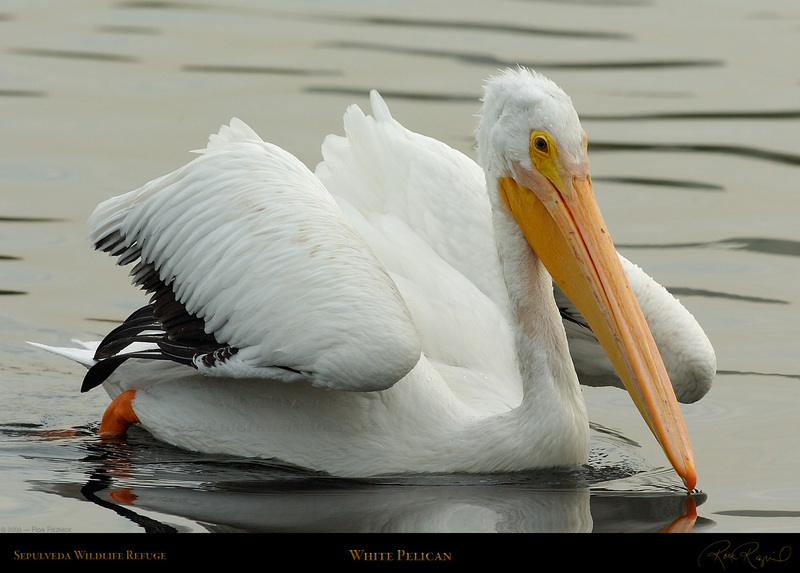 Down and Page Up keys on your keyboard to switch from the upper to lower image. You will be able to see the head, neck, shoulder and feather movements more easily. 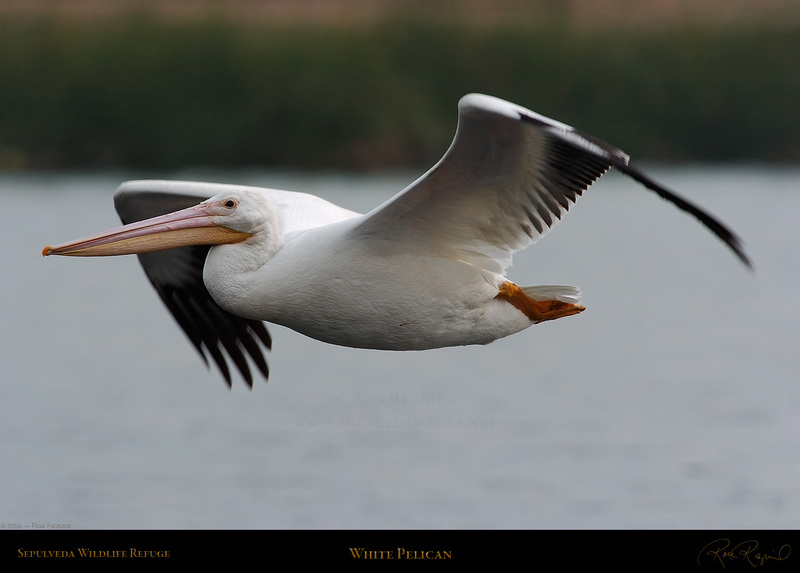 A White Pelican in soaring flight on an overcast day at Sepulveda Wildlife Refuge in December. 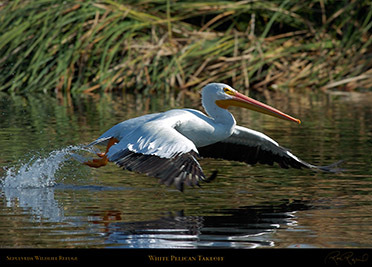 A White Pelican in flight on a clear day at Sepulveda Wildlife Refuge in November. A White Pelican flies into the pond at Sepulveda Wildlife Refuge at sunset in mid-September. 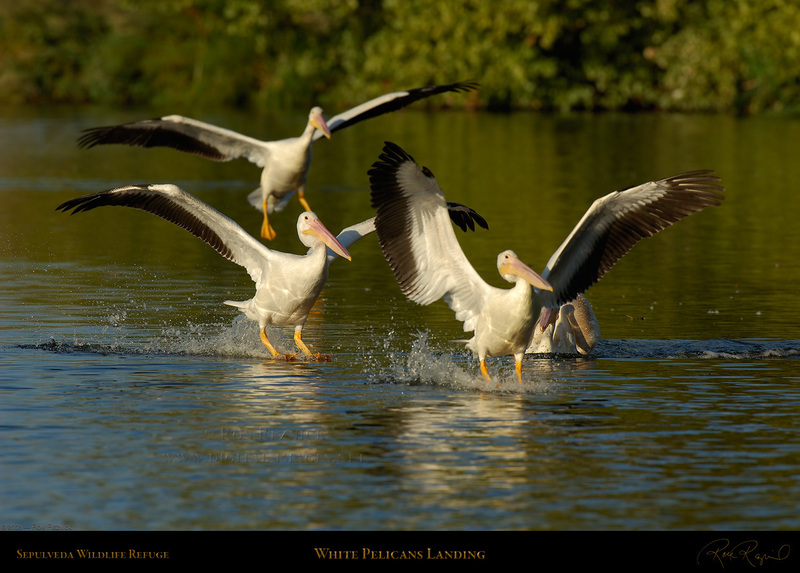 White Pelicans landing in formation at sunset. 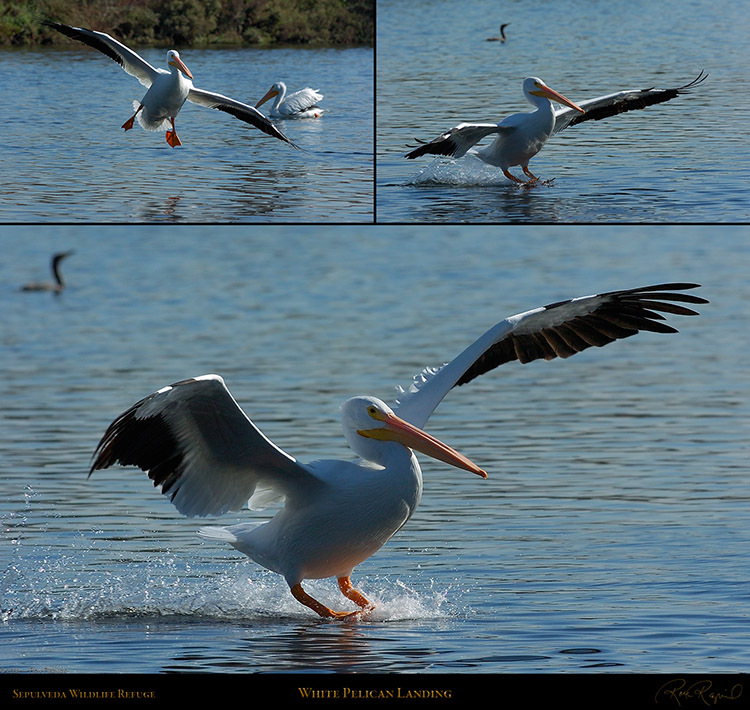 White Pelicans landing in the late afternoon in September at Sepulveda Wildlife Refuge. 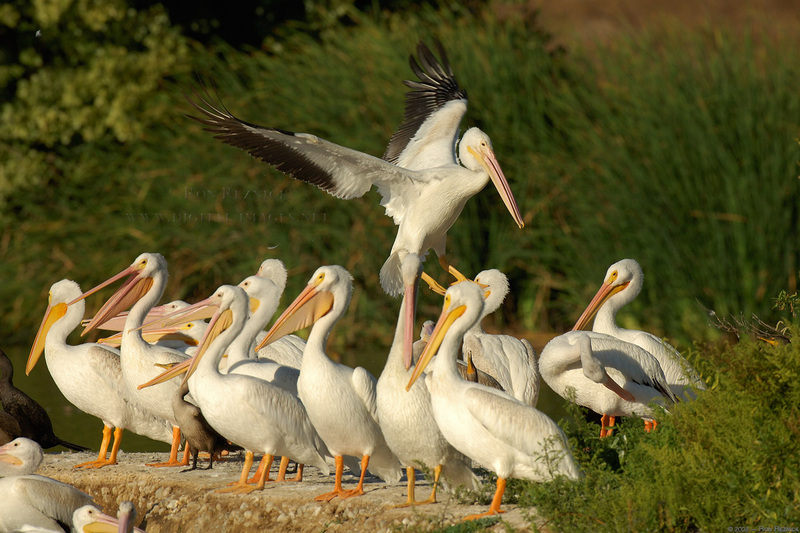 A group of their colleagues stand by to provide commentary on the landing technique. Pelicans generally prefer to land on water, but this fellow dropped right in on a prime piece of real estate. 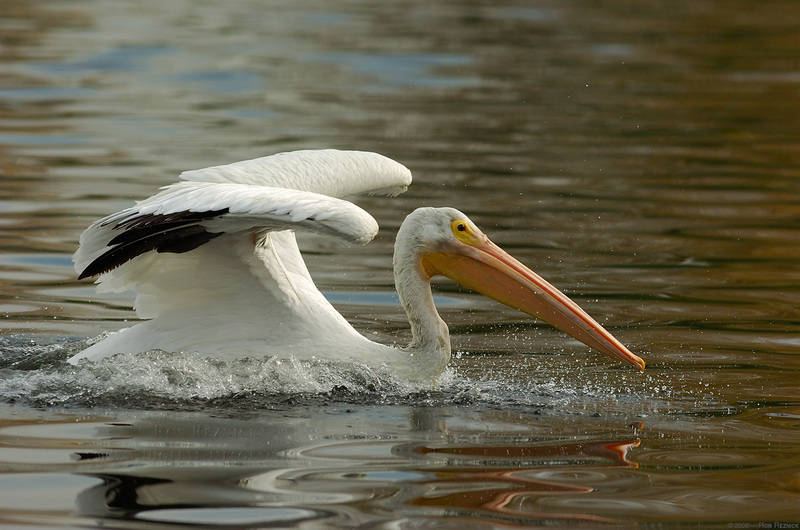 A White Pelican enters the water off the island in the middle of the pond at Sepulveda Wildlife Refuge. 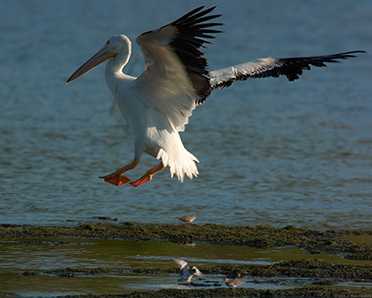 landing techniques of birds who want to join them. One bird seems bored. 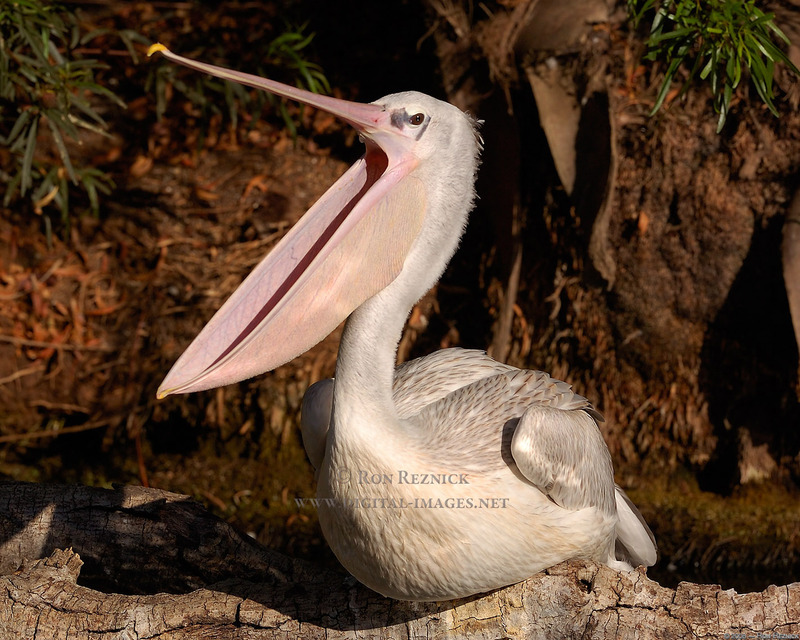 With a bill this massive, you had to know that a yawn would be impressive. 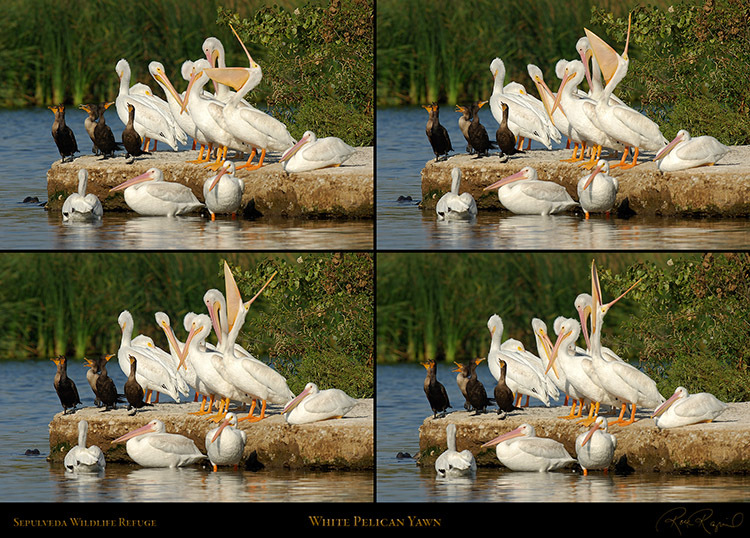 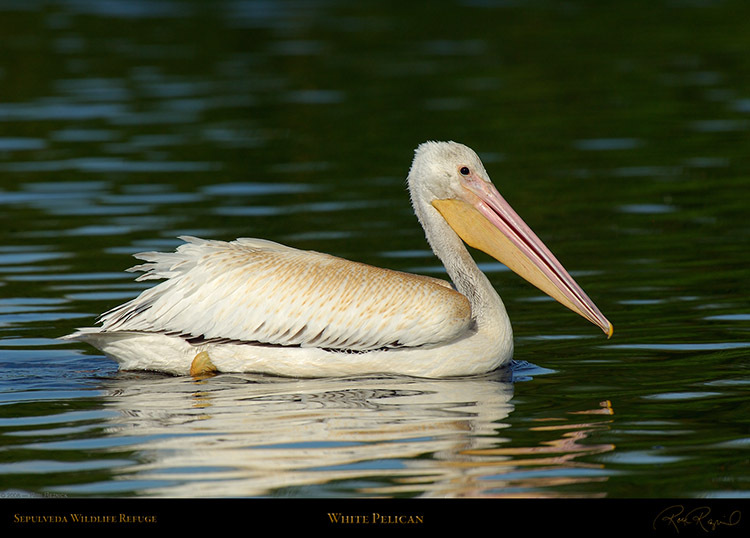 In the sequence above, a White Pelican puts all of his energy into a yawn. The yawning Pelican looks like a cartoon with his bill extended straight up. 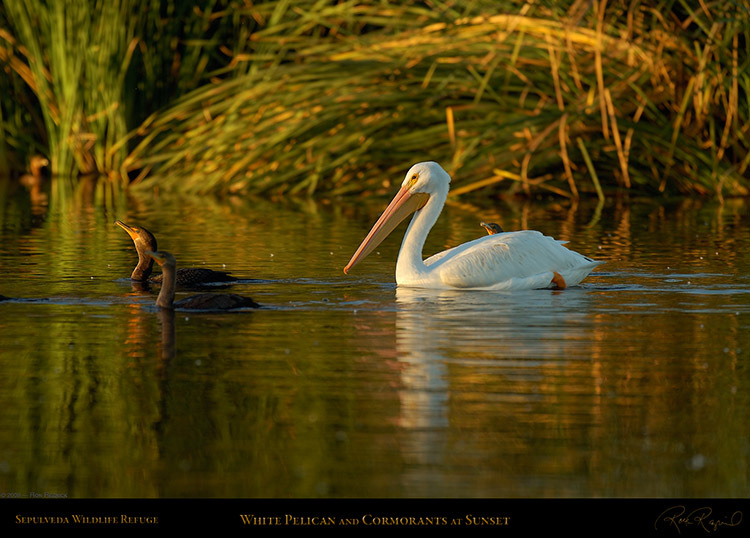 White Pelicans and Double-Crested Cormorants can often be seen together. A White Pelican poses for a late afternoon portrait at Sepulveda Wildlife Refuge in September. 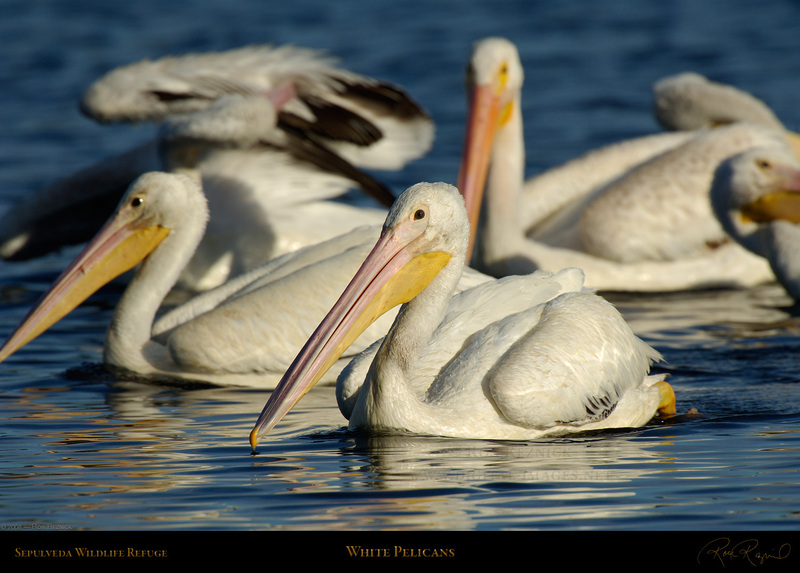 White Pelicans in the late afternoon at Sepulveda Wildlife Refuge. 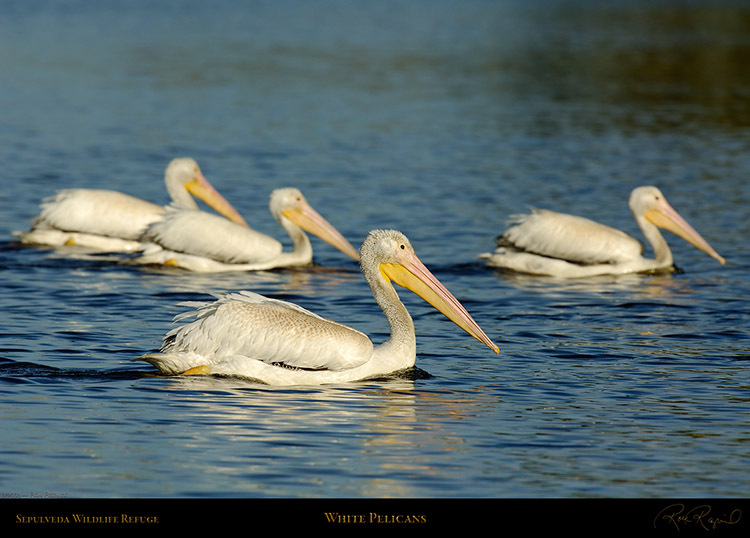 A group of White Pelicans patrolling back and forth across the pond at Sepulveda Wildlife Refuge. A White Pelican swimming on the pond at Sepulveda Wildlife Refuge in the low-angle light near sunset. A White Pelican in the dappled golden light of sunset at Sepulveda Wildlife Refuge. and losing feather detail or underexposing and losing color saturation can be quite challenging. 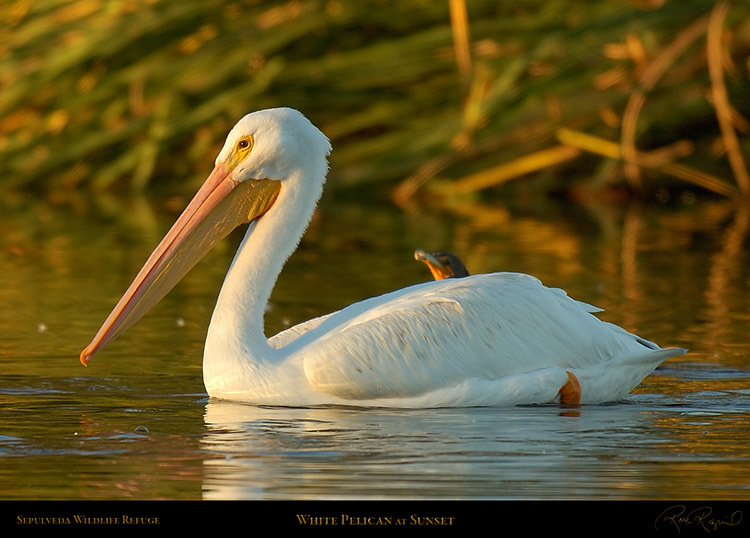 A White Pelican swims into the sunset with Cormorants at Sepulveda Wildlife Refuge in November. 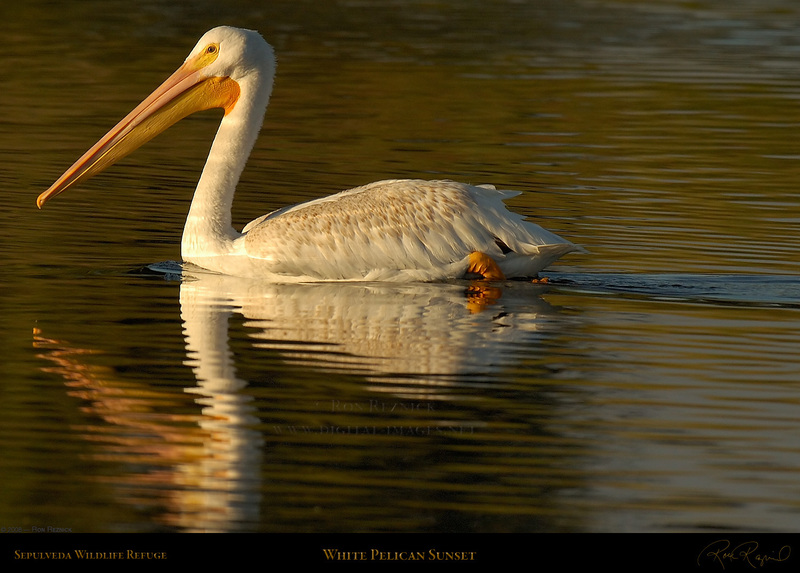 A detail crop of a White Pelican at Sunset (resized from the master image). 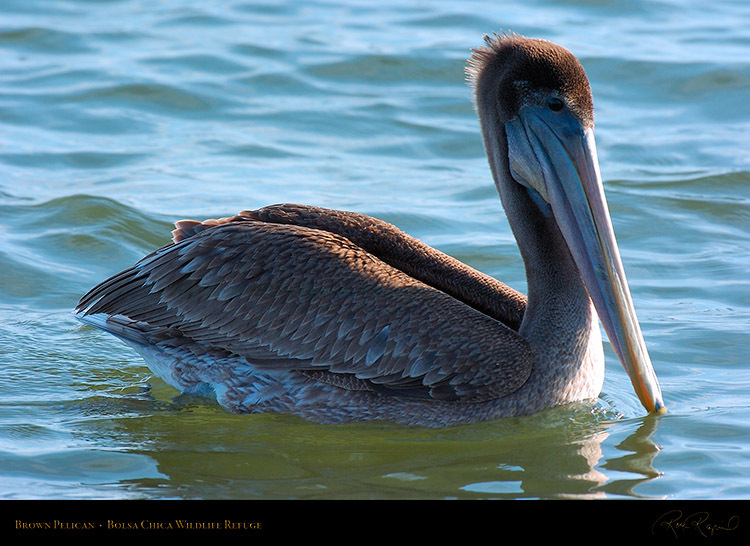 water to the ocean. 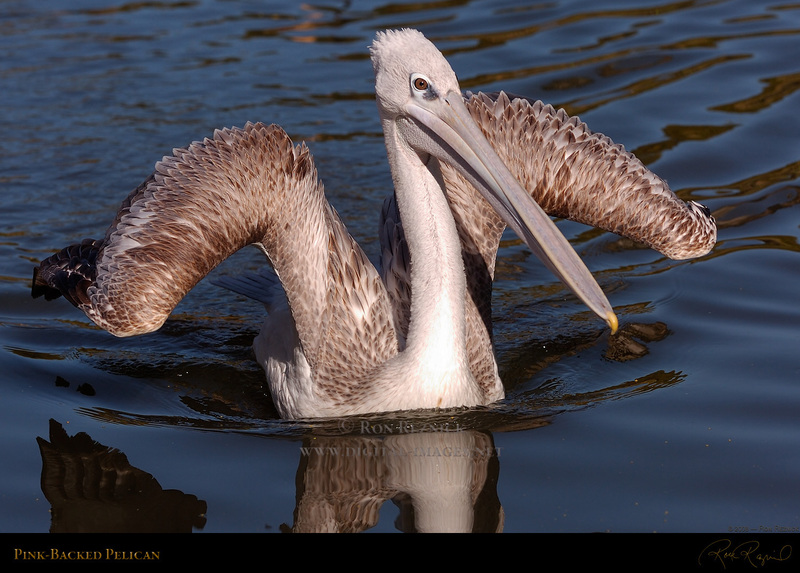 They typically reside in lakes and swamps of Africa and southern Arabia. The Pink-Backed Pelican has a pink, mauve, cream and brown color scheme and a yellow tip on its bill. 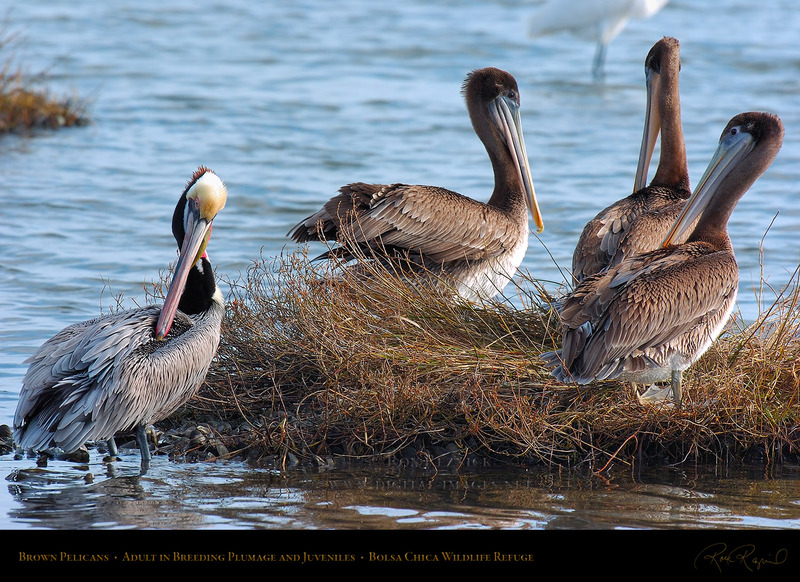 Note the large, webbed feet of the Pink-Backed Pelican.